AV Future Link Sdn. Bhd. (AVF) has been founded in the year 1998. AVF commitment and passion have never been changed and they have kept trying themselves proving to be the best to evolve. Until today, AVF has become one of the leaders in the market of distributing computer cases and accessories in Malaysia. Constantly, AVF has won itself a high reputation and recognition for unique craftsmanship, innovative technology and design on computer case, keyboard, mouse, multimedia speaker, and others unique tech tools. Best designs with finest quality are always pursuit. Time punctuation, safe delivery and competitive prices are the advantages taken by AVF to earn customers' loyalty and respects. After AVF is founded, the company's warehousing facilities has expanded tremendously. Now, from previously one warehouse, the company's has already possesses seven warehouse for storage and RMA department. AVF policy for the computer cases is to get into the niche market with unique designs which are different from the existing flat box looking. Furthermore, they distribute wide range of computer accessories and peripheral products as well. Last but not the least; AVF would always try the best to provide best services to the customers no matter now or in the future. 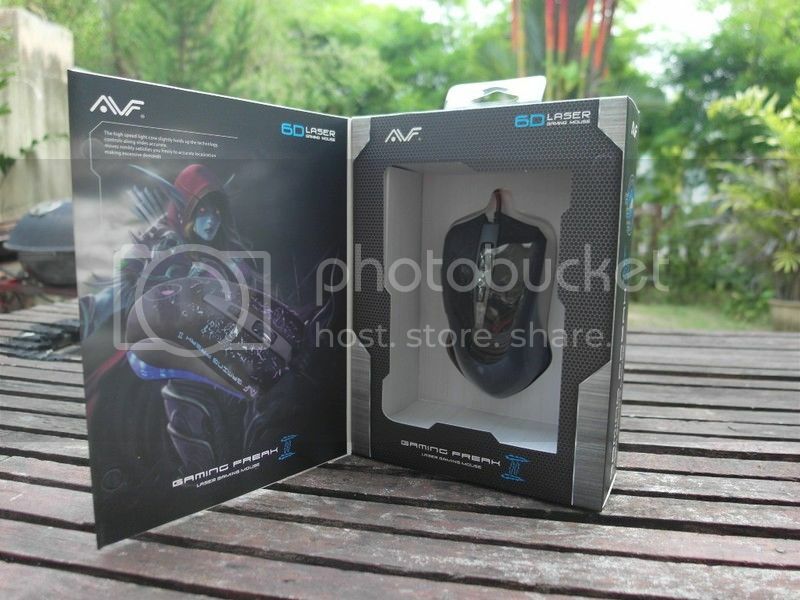 AVF Malaysia has sent to us several of their gaming freak mouse products to put into test. 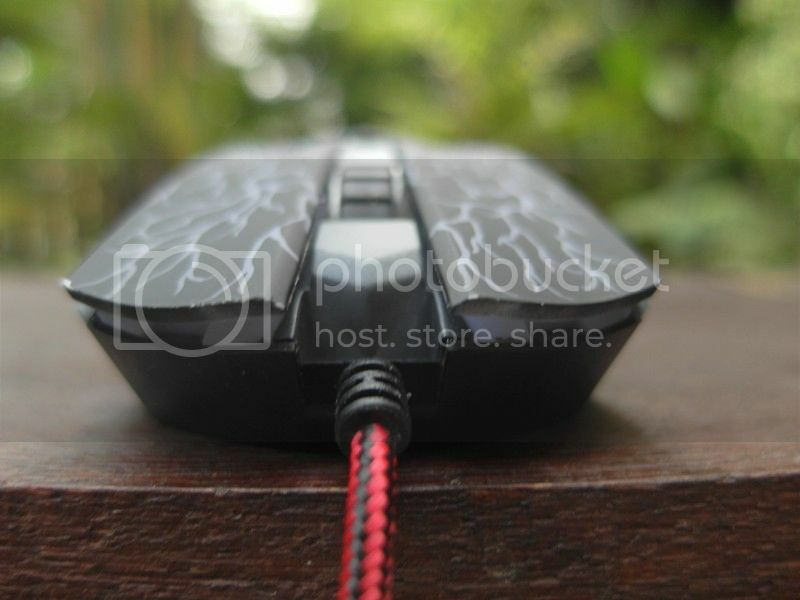 Today, we able make a round up review of AGM X1, X2, X3, X4, X5 ,X6,X7 and X8 Gaming Freak II 6D Gaming Mouse. 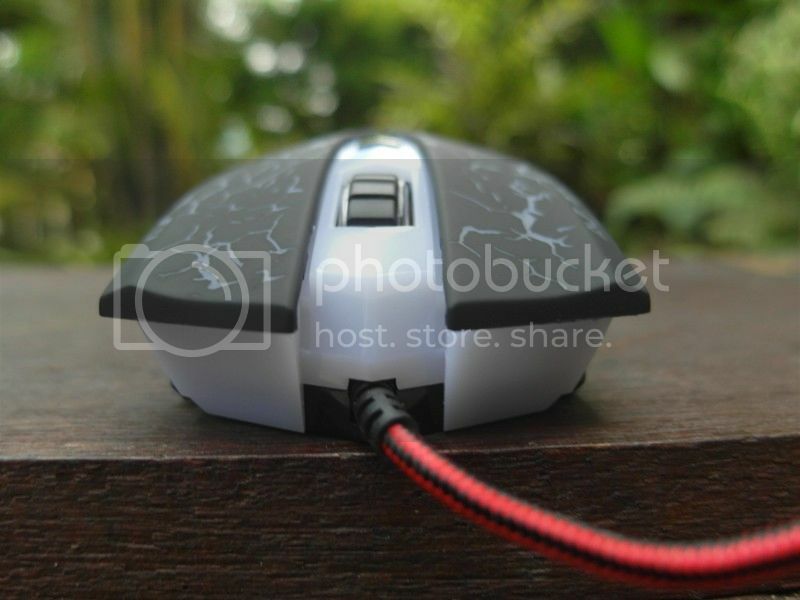 All the models that mentioned above are fully sleeved cord with nylon and approximately 1.8m long, which makes the mouse looks premium-build and long enough to support from back I/O panel of PC into user mouse pad. 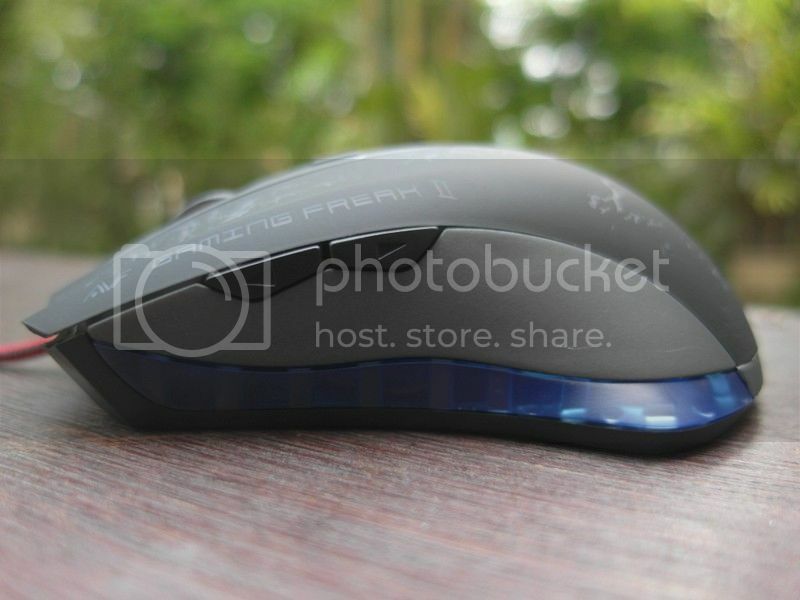 AVF manage to create a mouse full of useful features like mute button and super long 5 million click time life with the price tag minimum of RM39, which makes this mouse perfect for gamer and end user to get their hand with budget and economical mouse but with premium features. 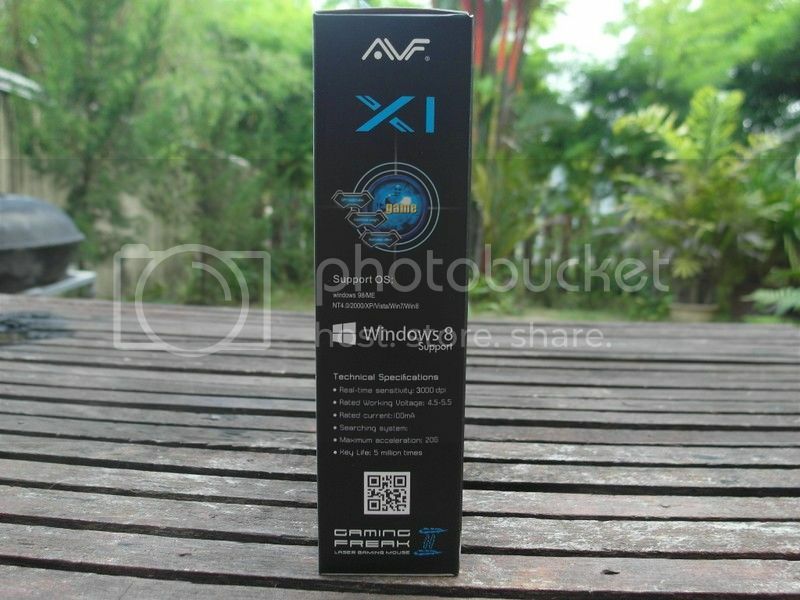 As the package of each model is almost the same and the only difference between each model is the shape and DPI level, so we just make a single unboxing of AGM-X1 as the representative of AVF Gaming Freak II AGM Round Up. 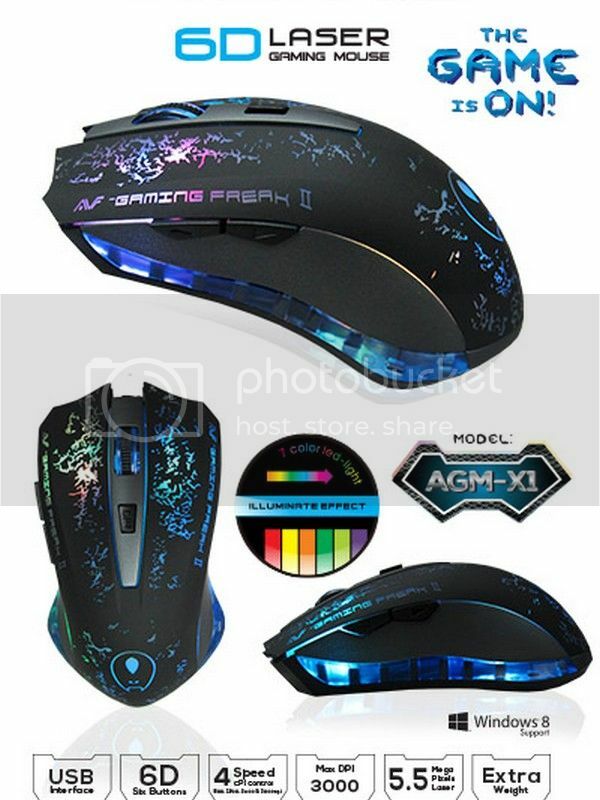 The front box highlighted the X1 mouse overall design with blue theme flame effect on the background. 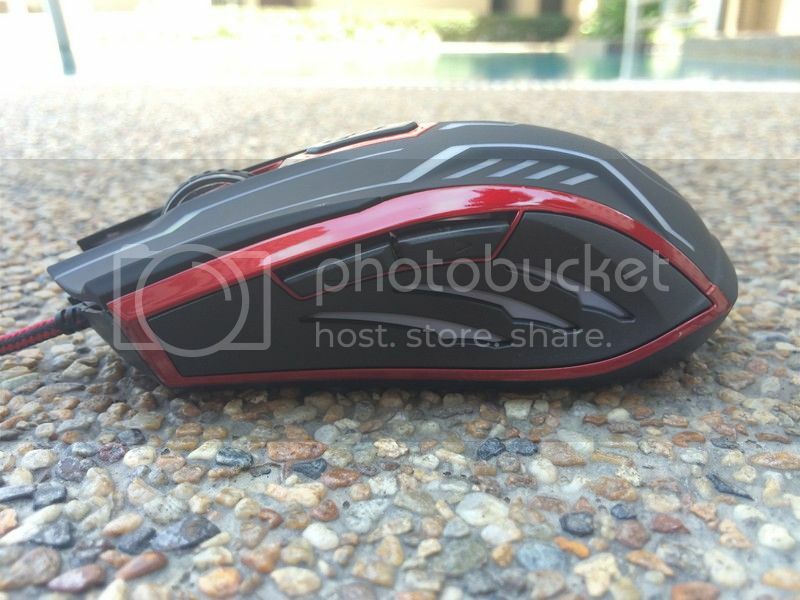 User can easily notice the model of the mouse which stated at the bottom right of the box. 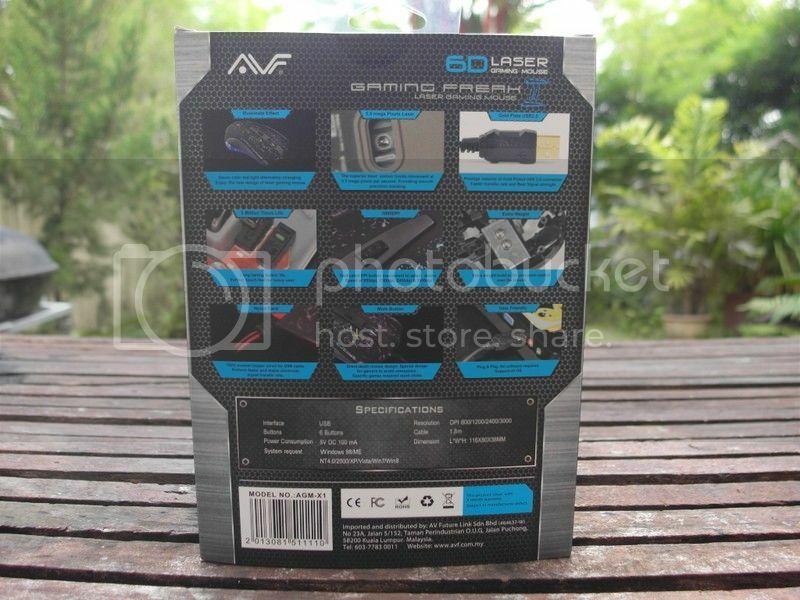 AVF also focus on showing this mouse is comes with 6D Laser Gaming Mouse Technology on the top right of the box. 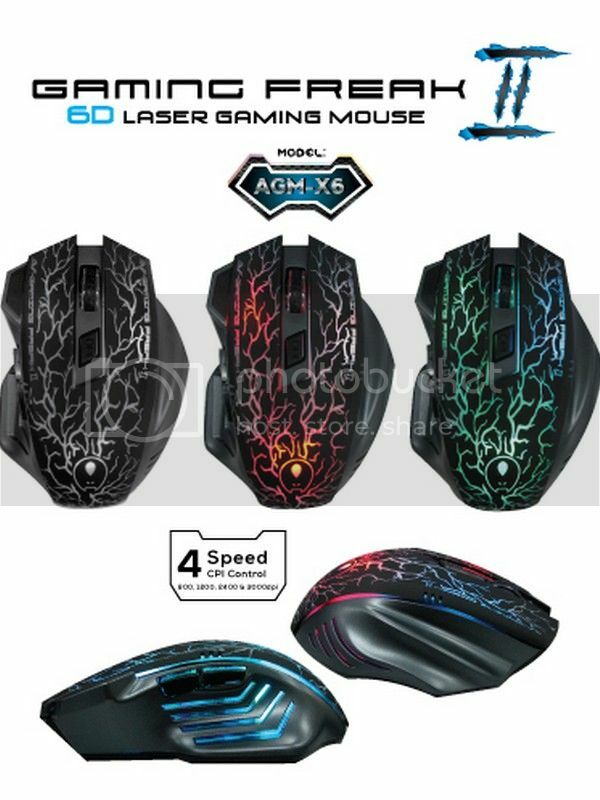 AVF makes the AGM Gaming Mouse comes with illuminate effect of seven color led-light alternately changing when powered up with the USB. At the back, user able to looks at more features such as illuminate effect, 5.5 mega pixels laser, gold plate USB2.0, 5 million times life, up to 3000DPI, Extra weight, nylon cord, mute button and user friendly. 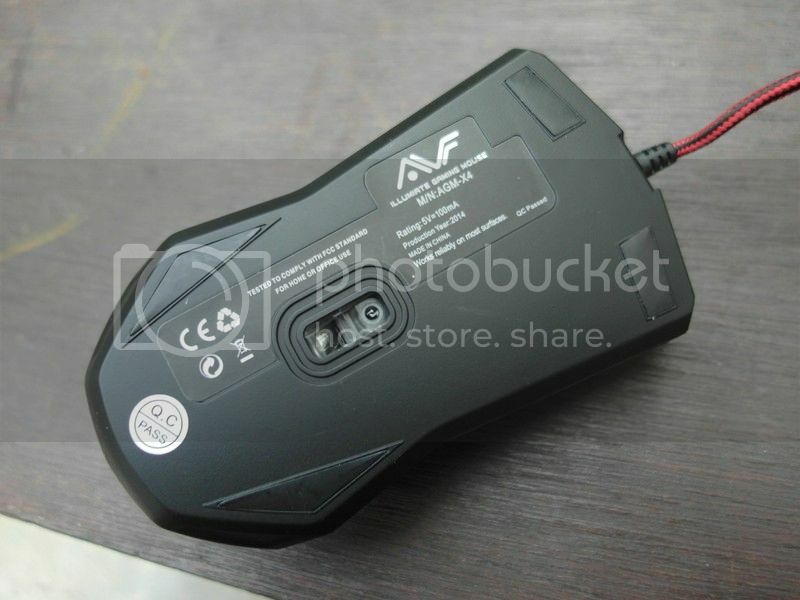 AVF stated the detail specifications of the mouse and this product cover with 3 month of warranty. 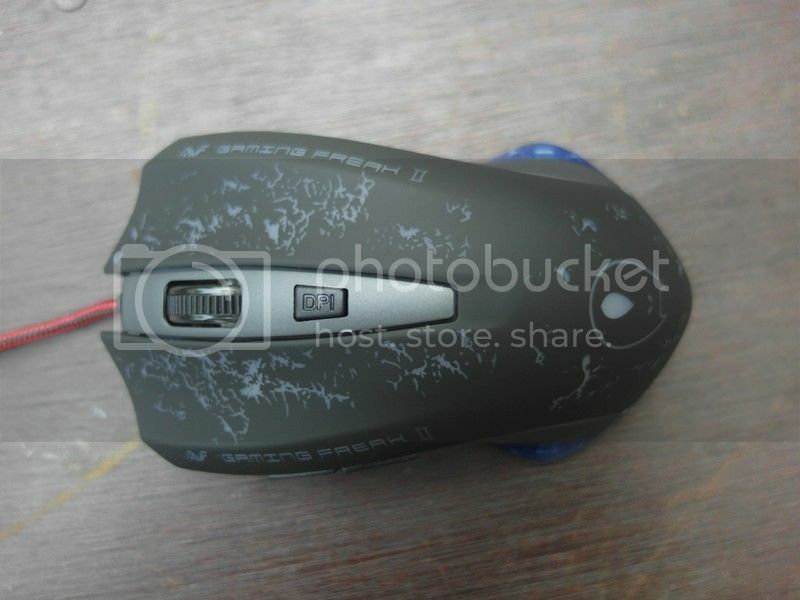 User can find supported OS by this mouse of Windows 98/ME NT4.0/2000/XP/Vista/Win7/Win8 and technical specifications such as real time sensitivity, rated working voltage, rated current, max acceleration and key life on the right side of the box. The front box can be flipped open and shows the lair of the mouse on transparent plastic cover so user can easily test the mouse size to fit and comfort with their hand on the spot and on the left, AVF shows graphical view of the mouse with a character of armored girl holding a bow. 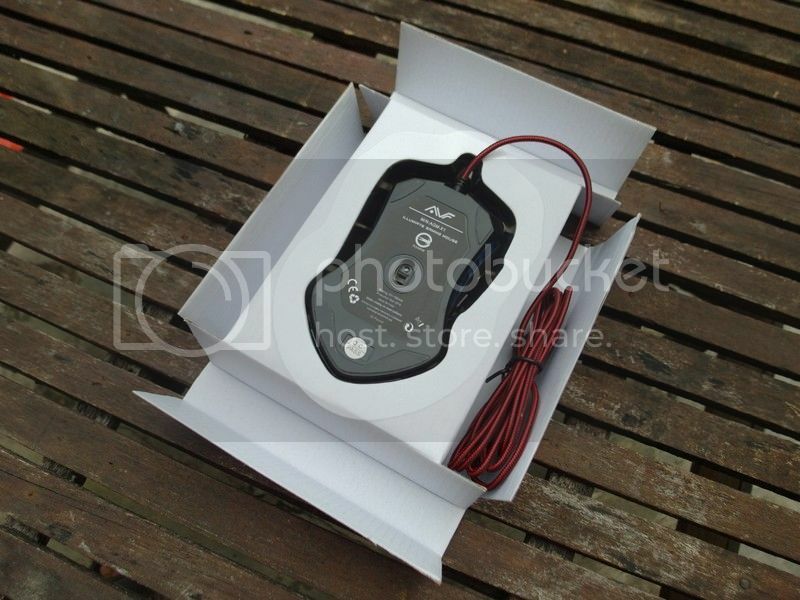 Upon unboxing, the mouse is well kept in a plastic cover and user can notice there’s a gap between the cardbox to absorb external pressure. The cable is nicely packed with a cable tie. There are no other accessories or manual book bundled with the mouse. 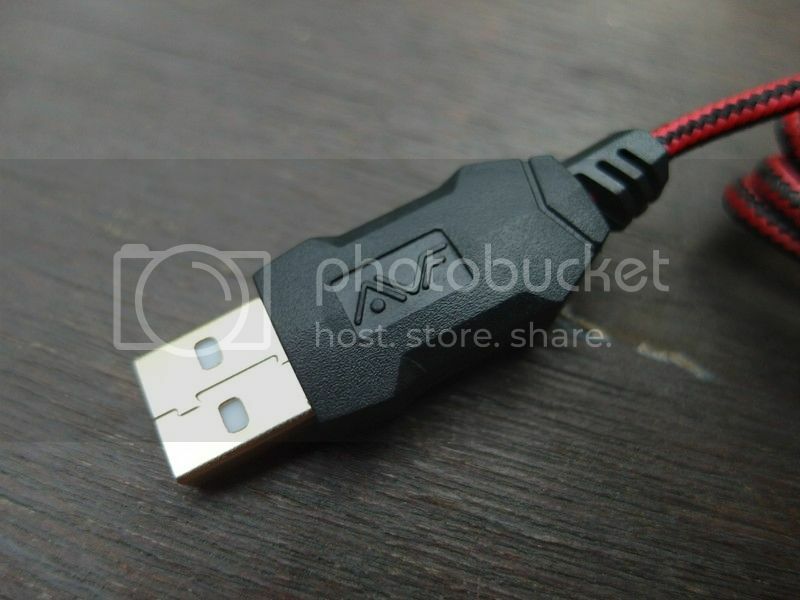 AVF is using prestige material of gold plating technology for the mouse USB 2.0 connector. Gold plate is said to be faster transfer rate and best signal strength compared to standard USB connector. 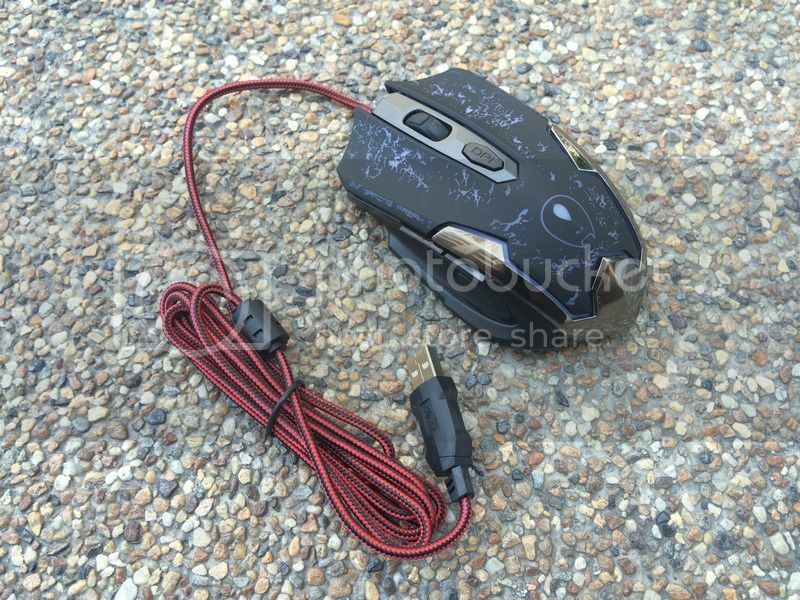 This mouse is built in with Ferrite bead to suppress high frequency noise in electronic circuits from the USB to the mouse. 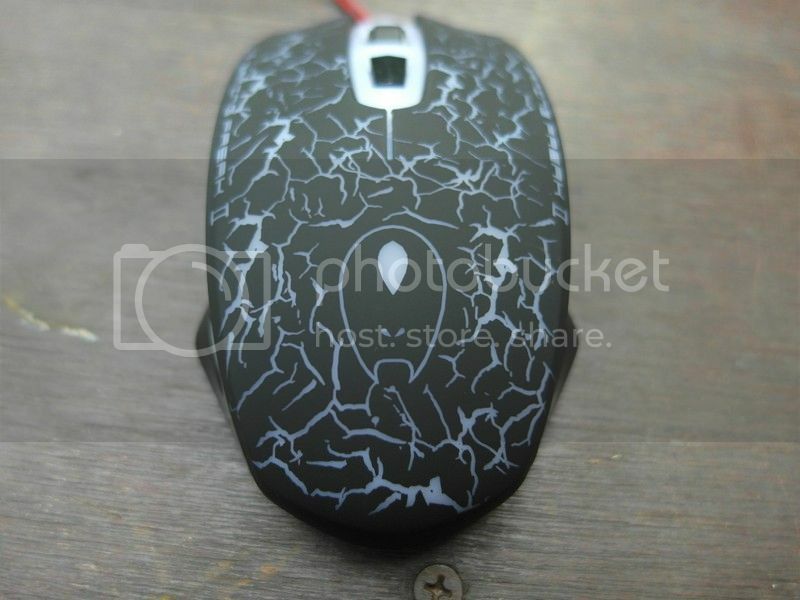 Easily said, it helps to reduce interference so that the mouse can works in better performance. On this section, we will go though each of the mouse models for the closer look. There is 3 type of common grip style when using a gaming mouse, Palm Grip, Finger Grip and Claw Grip. Each of the mouse models have different type of grips and design to help user find the right mouse to fit with their hands. 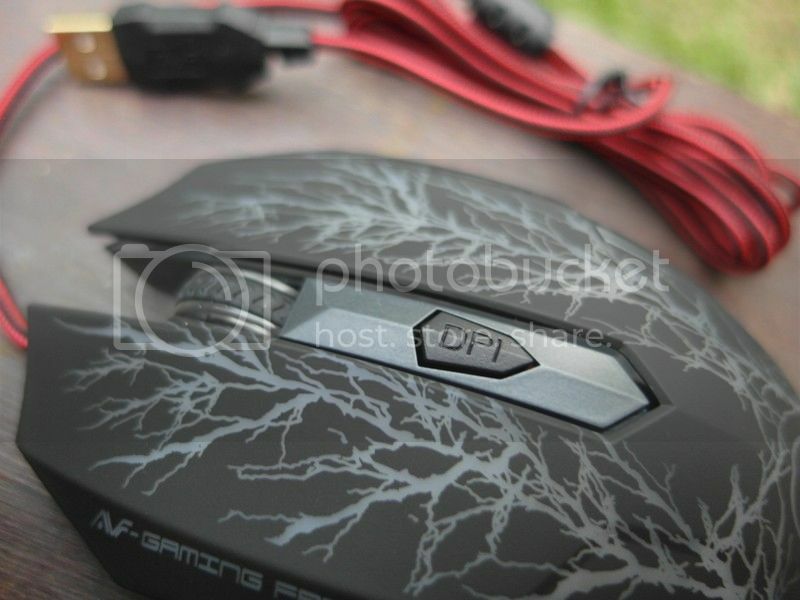 The overall view of the AVF AGM-X1 Gaming Freak II Mouse. 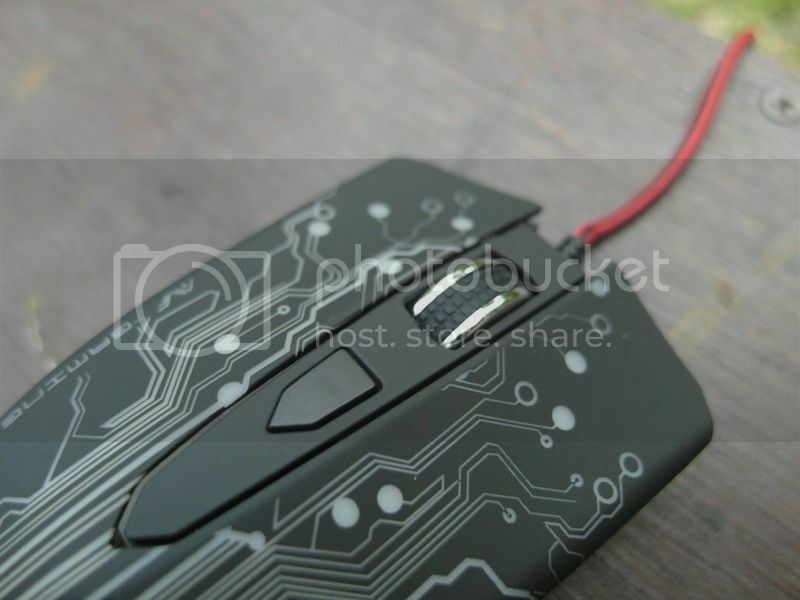 On each model they have different design on the mouse surface which will be glow with illuminate led-light when powered up with connector to the user’s PC. 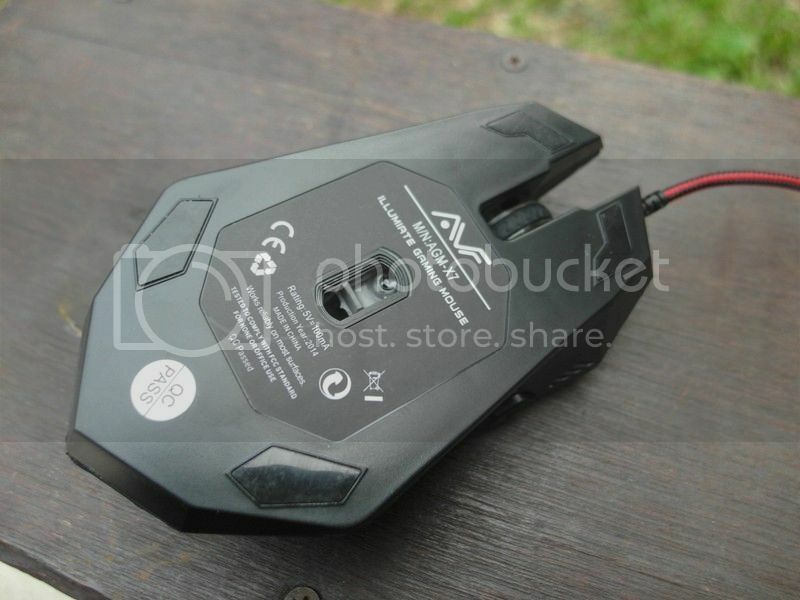 On the bottom of the mouse, user able to confirm the model name of AGM-X1 and simple information of rating and production year. On the left side, the AGM-X1 have a smooth surface with 2 button which can be programed by using 3rd party freeware software like X-Mouse Button Control. Or by defaults the button act as back from previous page or move forward when using with browser. 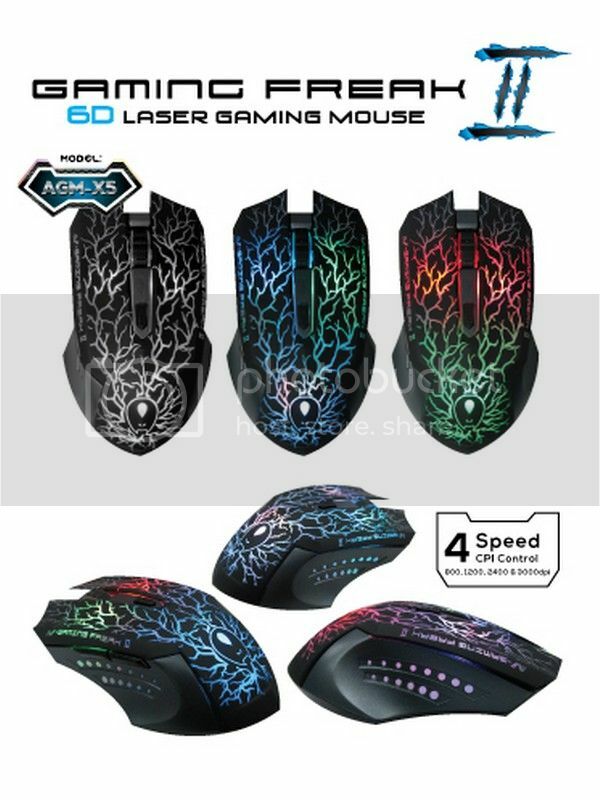 On the right side, the mouse have same smooth surface with blue lines which also have illuminated led-light effect. 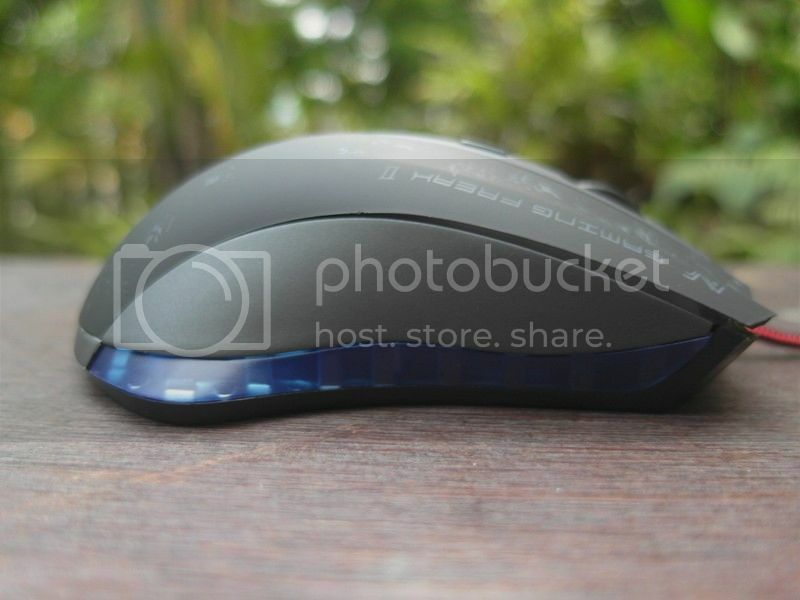 What we so interested the most on this mouse is the DPI Button switch which is easily access just next to the scroll wheel which user able to select desire DPI range from 800, 1200, 2400 and 3000. 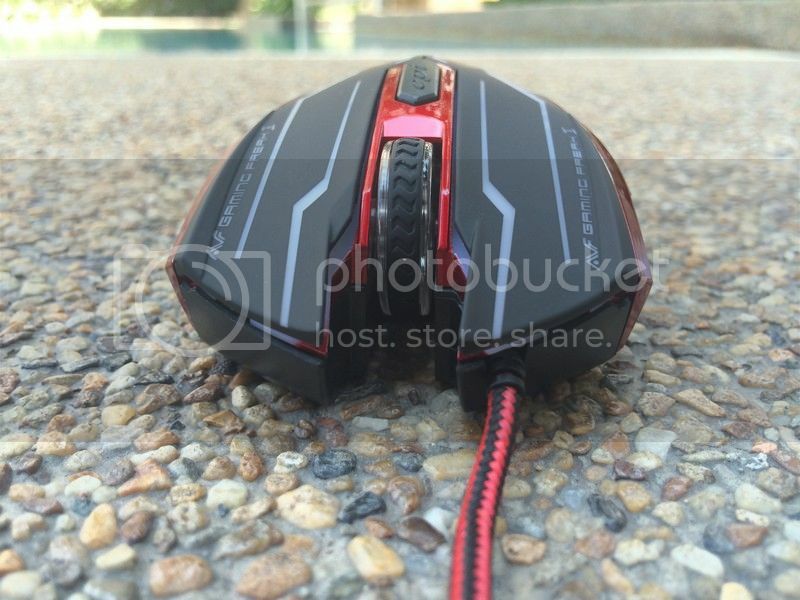 The front view of the AGM-X1 Gaming Mouse. 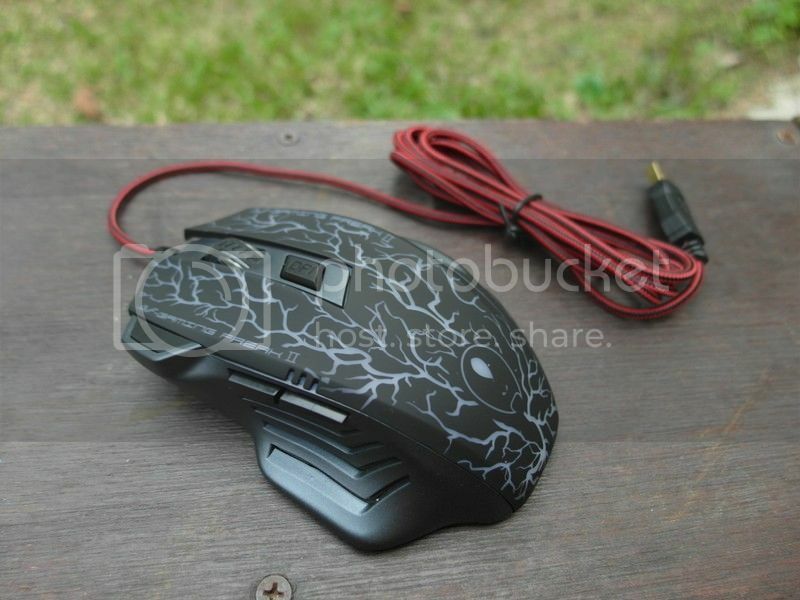 The cable is 100% enamel copper wired with nylon braided which makes it looks like a premium gaming mouse. 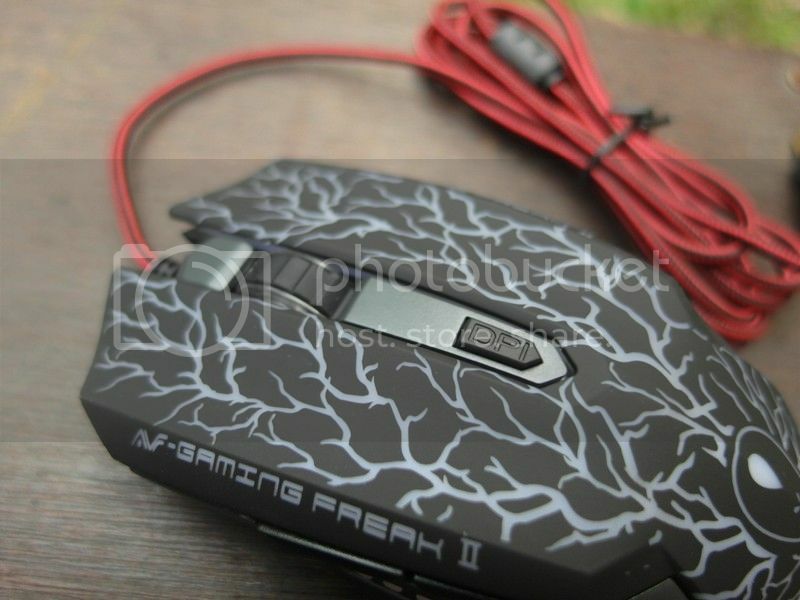 Overview of the AVF AGM-X2 Gaming Freak II Mouse. On this model, there’s a shiny red lines on the left and right of the mouse include near the scrolling wheel and CPI button. 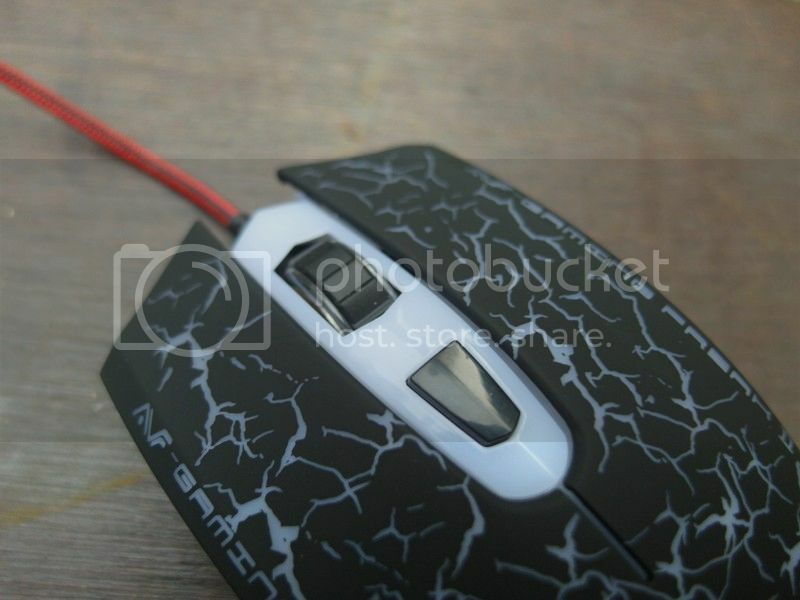 As this mouse size rather smaller compare to other model, it’s very suitable for user that looking for claw grip design. User can quickly change the CPI mouse range of 800, 1200, 2400 and 3000. CPI is stands for Counter per Inch which will determine how fast the mouse cursor on user screen moves when user move their mouse. The right and left click is layered with rubberized materials to reduce the finger from slipped. On the left side, there 3 stripes that illuminate with the led-light effect and 2 buttons that can be configure by using 3rd party software or by default to move front or reverse on browser. There’s no button on the right side and only 3 stripes that vice versa design from the left. Both of side is made out of plastics. 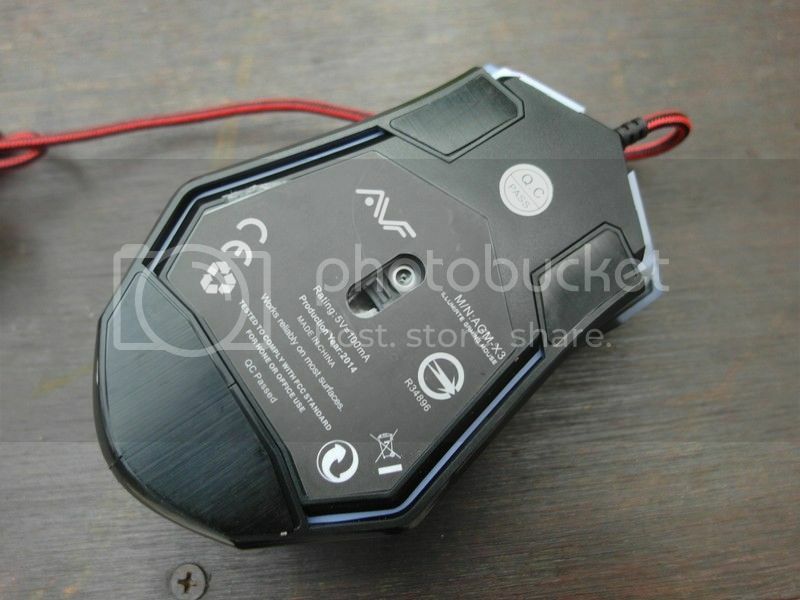 On the bottom of the mouse, user able to confirm the model name of AGM-X2 and simple information of rating and production year. The bottom part is fully made from plastic. The design of AVF AGM-X3 is suitable for palm grip as the size is slightly bigger and taller than other models. The cable is tied with cable ties and fully braided with nylon for premium outlook. The DPI button is easily access by user to change from 800, 1200, 2400 or 3000. The left and right surface is rubberized for easy grip. On each model, there’s a Gaming Freak Logo which looks like an alien with one eye and 2 nose hole. The white is semi-transparent which will glow with illuminate effect of led-light. 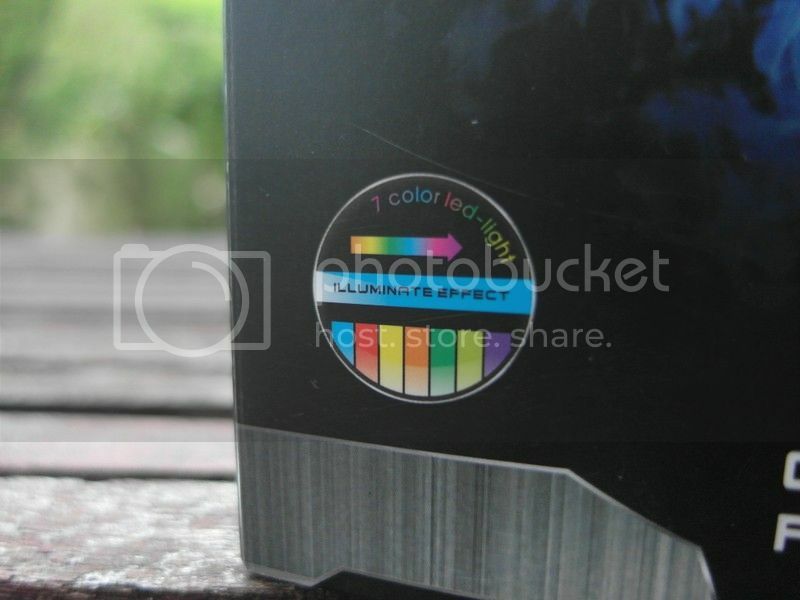 On the left side, there are 3 stripes which also will glow when connected with USB Port and 2 easy configure buttons. On the right side, its plain plastic with 3 stripes design. The curve line on top of the stripes will have illuminate effects too. 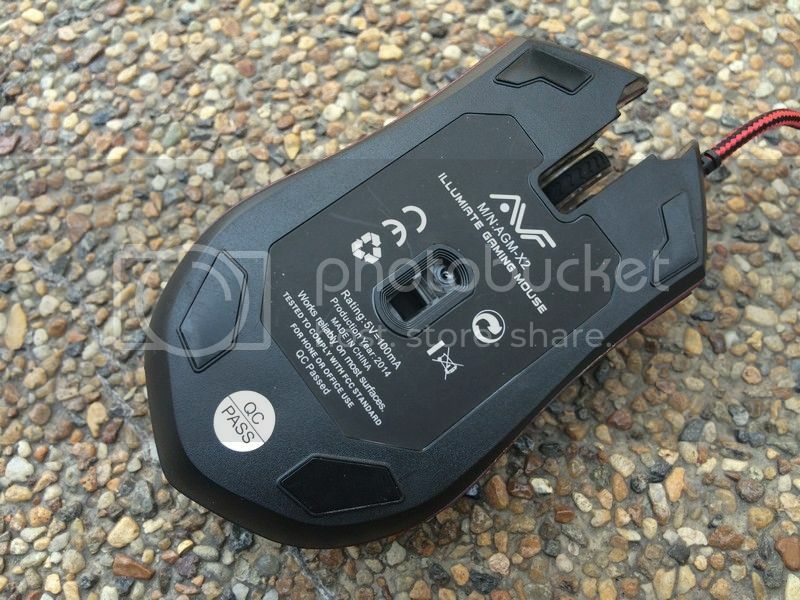 On the bottom of the mouse, user able to confirm the model name of AGM-X3 and simple information of rating and production year. The bottom part is fully made from plastic. 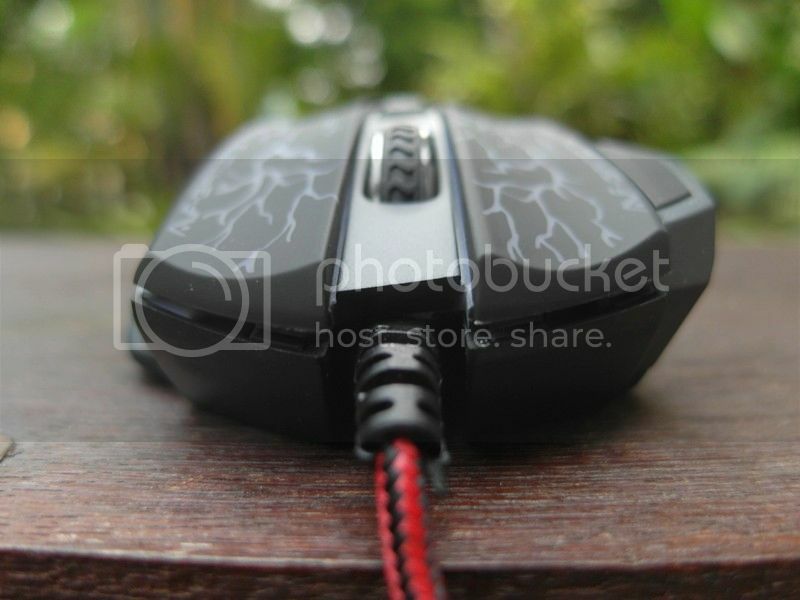 The front look of the mouse with braided nylon cable coming out from the middle. The main body is made out of semi-transparent plastic which might looks like a cheap material. 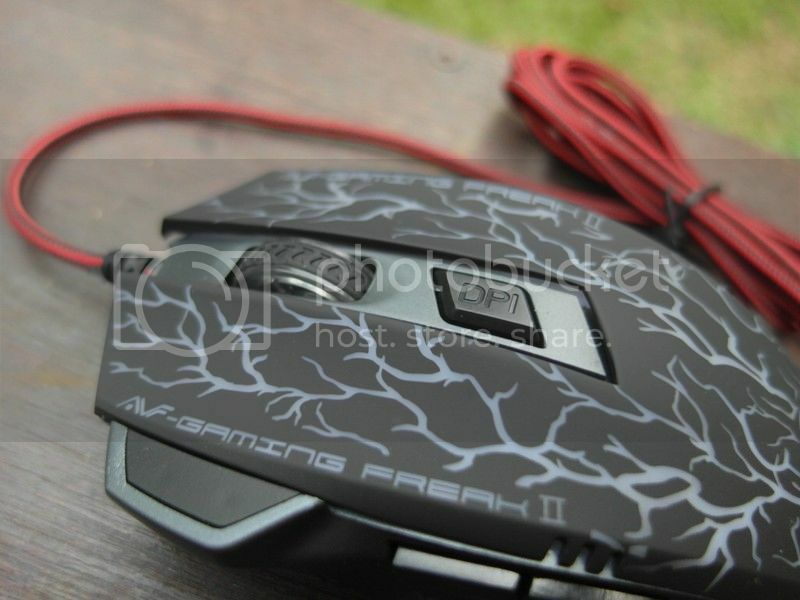 The overall view of the AVF AGM-X4 Gaming Freak II Mouse. The network-look design will be glow with illuminate led-light when powered up with connector to the user’s PC USB port. 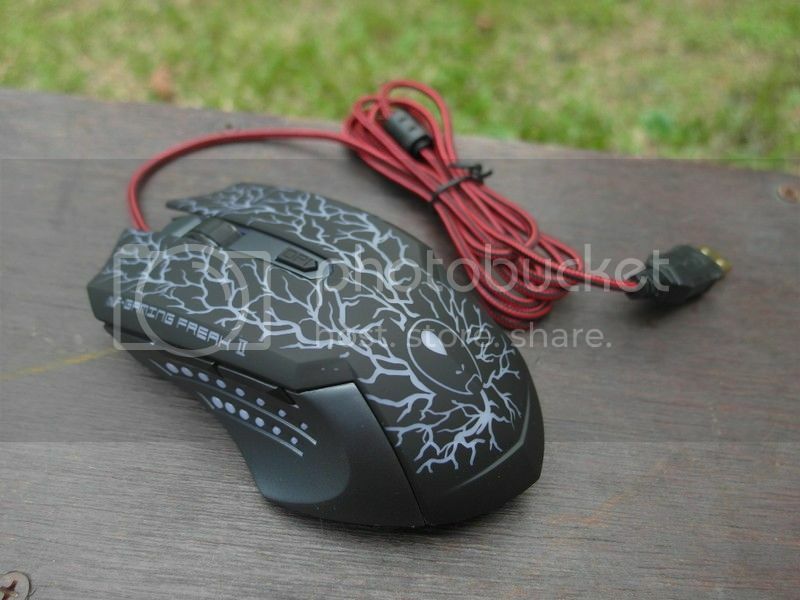 This mouse is suitable for claw grip user as for the size. User can quickly change the speed of the mouse range of 1200, 2400 and 3000. The right and left click is layered with rubberized materials to reduce the finger from slipped. Compare with previous model, this unit does not have DPI or CPI words on the speed change button. 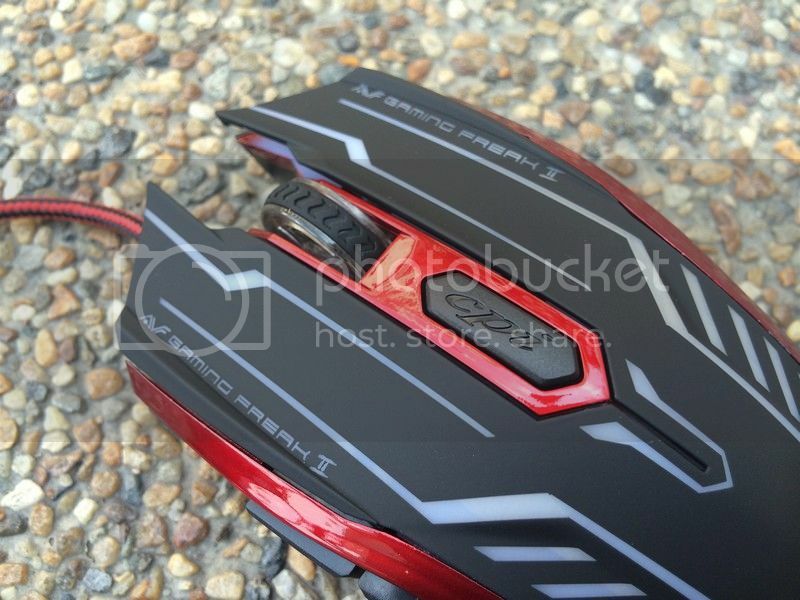 The front looks of the AGM X4 Gaming Mouse. The cable is approximately 1.8m long with nylon braided for extra protection. 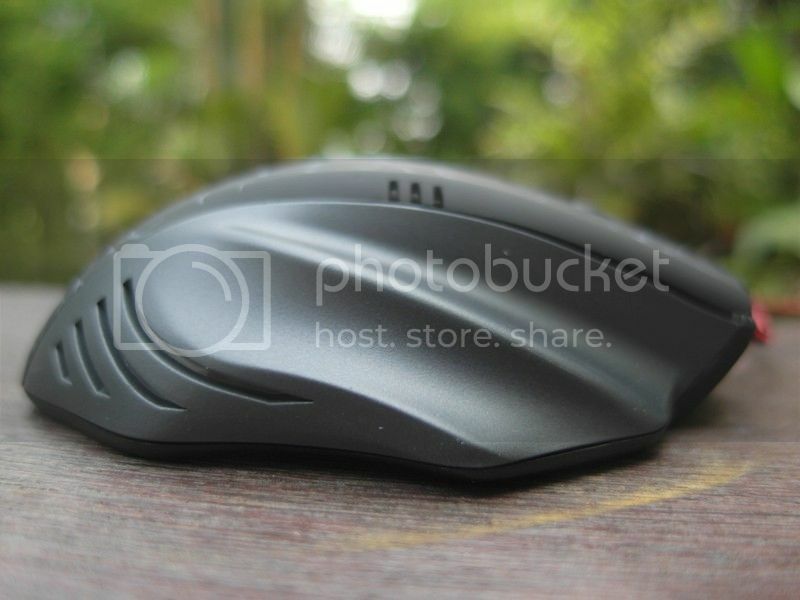 The right side of the mouse is fully smooth surface without any design like on the previous model. 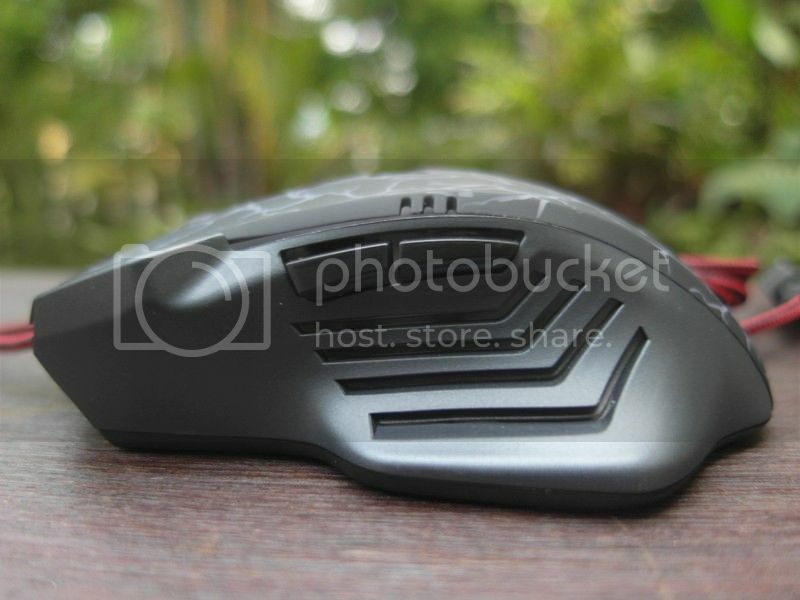 There’s a rubberized part on the left side of the mouse with 2 buttons that can be further configure using 3rd party software. 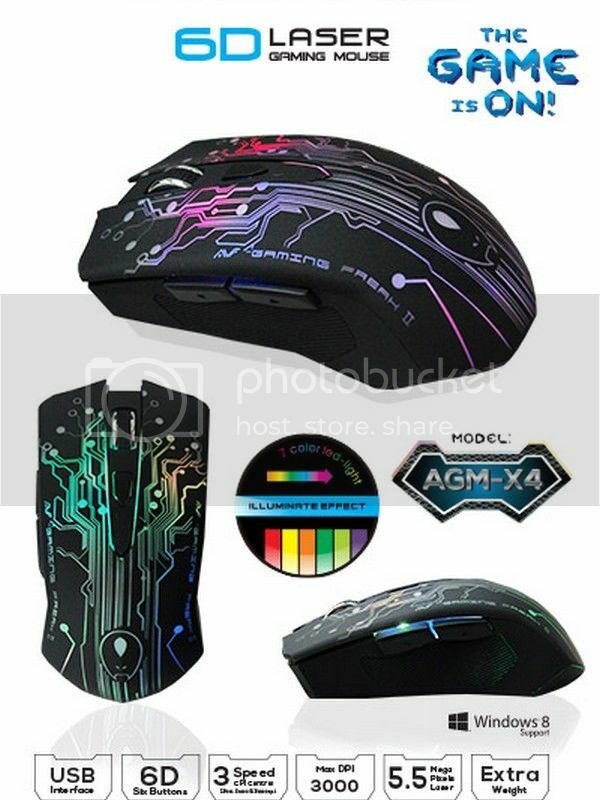 On the bottom of the mouse, user able to confirm the model name of AGM-X4 and simple information of rating, Q.C Pass sticker and production year. The bottom part is fully made from plastic. The design of AVF AGM-X5 is suitable for fingertip grip user for it size. The cable is tied with cable ties and fully braided with nylon for premium outlook. On the top surface is fully layered with rubberized materials for easy grip. 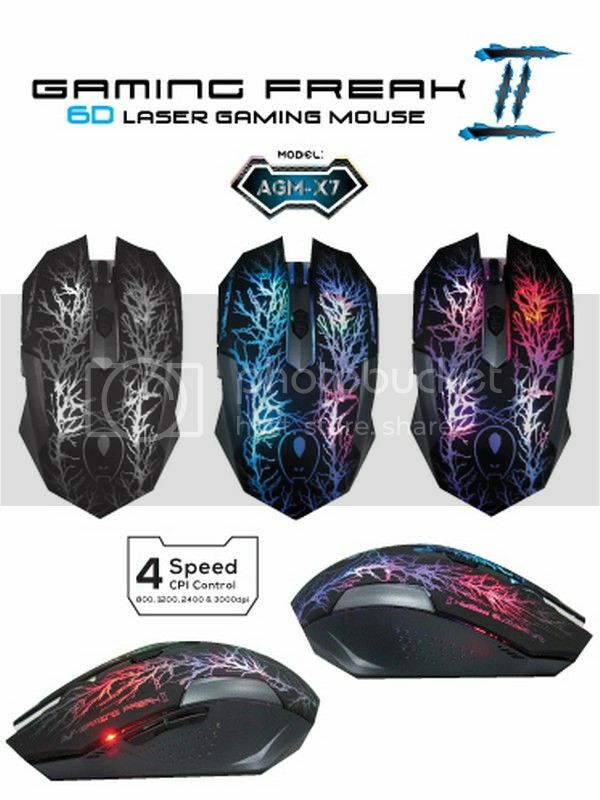 The mouse colour is combination of black and grey with semi-transparent lightning design that have illuminate led light effect when connected on USB port. The DPI button can change the mouse speed of 1200, 2400 and 3000. 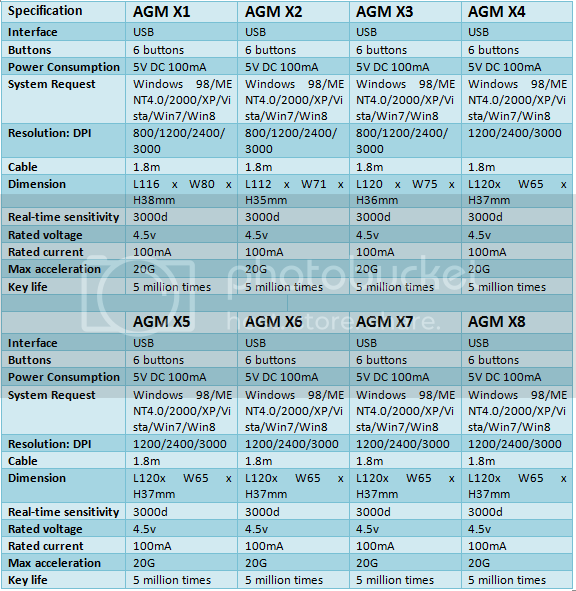 On the bottom of the mouse, user able to confirm the model name of AGM-X5 and simple information of rating and production year. The bottom part is fully made from plastic. There are dots on left side of the mouse which also have an illuminate effect. The 2 buttons that can be configure by using 3rd party software or by its default. On the right side, the mouse have the same dots design with the left and illuminate effects. 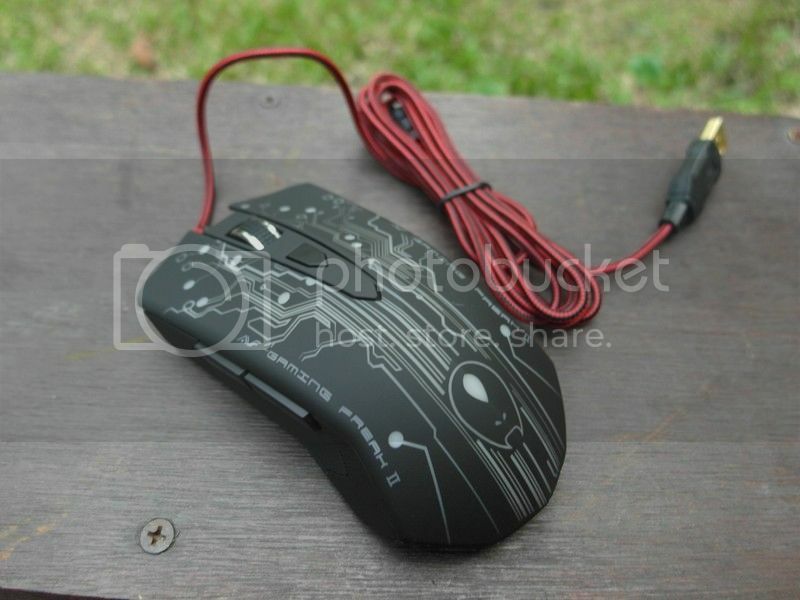 Front look of the mouse looks like an arrow-shape on the middle with braided nylon cable coming out from the mouse. 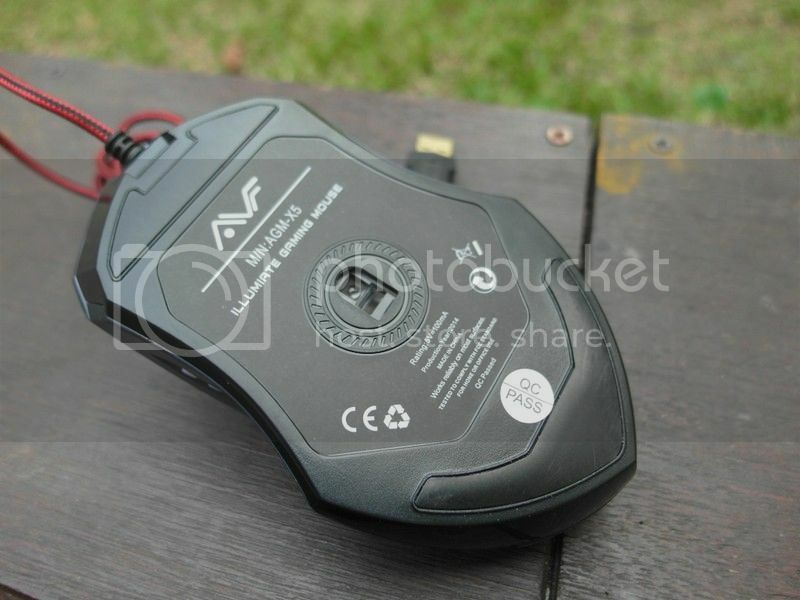 The design of AVF AGM-X6 is suitable for palm grip as the size is very big than other models. 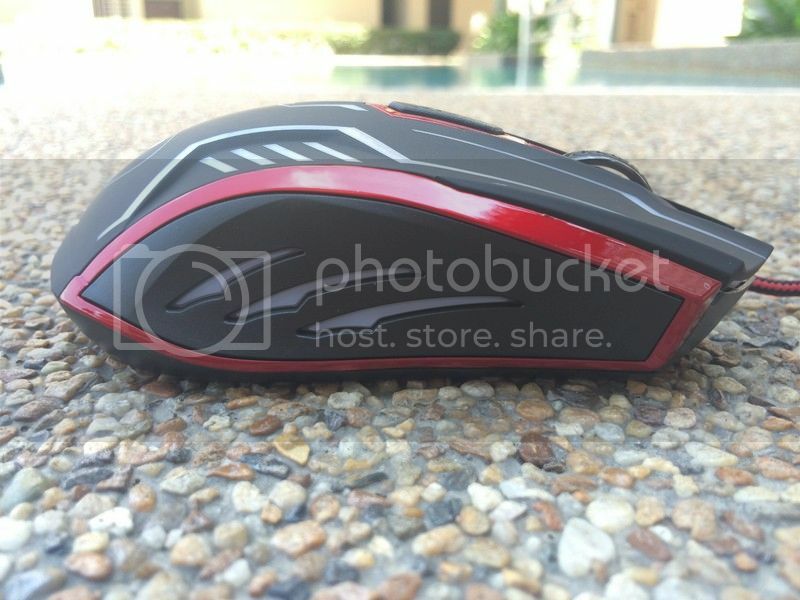 User can fully rest of their hand on this mouse without touching the mouse pad. 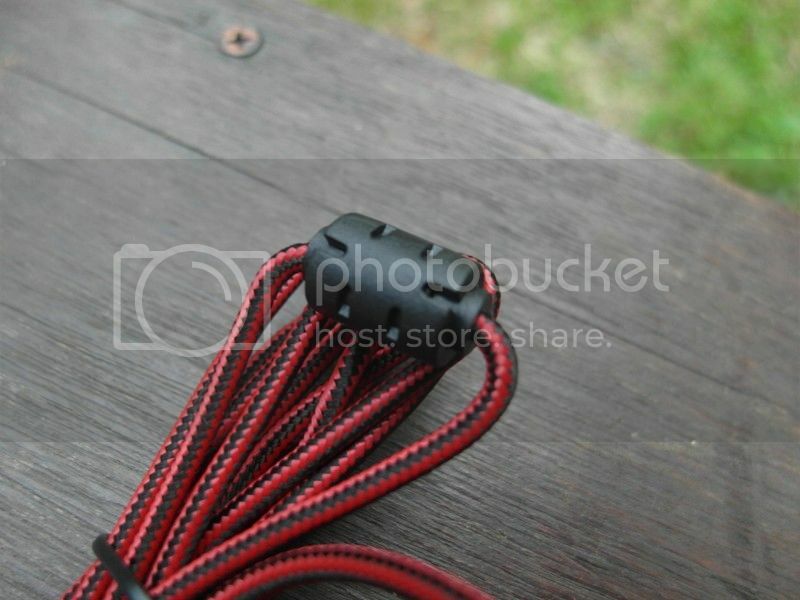 The cable is tied with cable ties and fully braided with nylon for premium outlook. User can quickly change the DPI mouse range of 1200, 2400 and 3000. DPI is stands for Dot per Inch which will determine how fast the mouse cursor on user screen moves when user move their mouse. 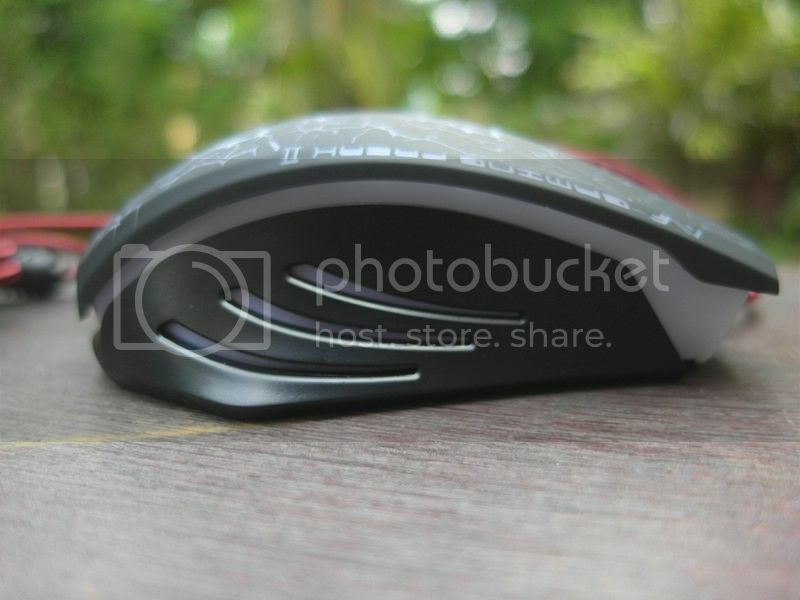 The right and left click is layered with rubberized materials to reduce the finger from slipped. There are 2 buttons on the left side of this mouse and thumb rest shape with 4 stripes design. The stripes are fully glowing with illuminate effects. As look from the front. The mouse is very big and the cable is fully braided with nylon at approximately 1.8m longs. The design of AVF AGM-X7 is suitable for palm grip and the size is slightly bigger and taller than AGM-X2. The cable is tied with cable ties and fully braided with nylon for premium outlook. The DPI button is easily access by user to change from 1200, 2400 and 3000. The left and right surface is rubberized for easy grip. 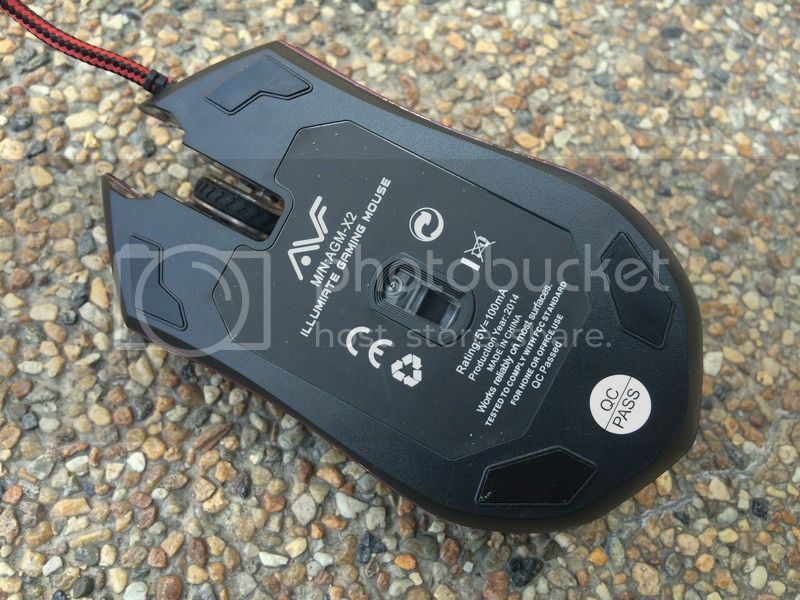 On the bottom of the mouse, user able to confirm the model name of AGM-X7 and simple information of rating and production year. The bottom part is fully made from plastic. 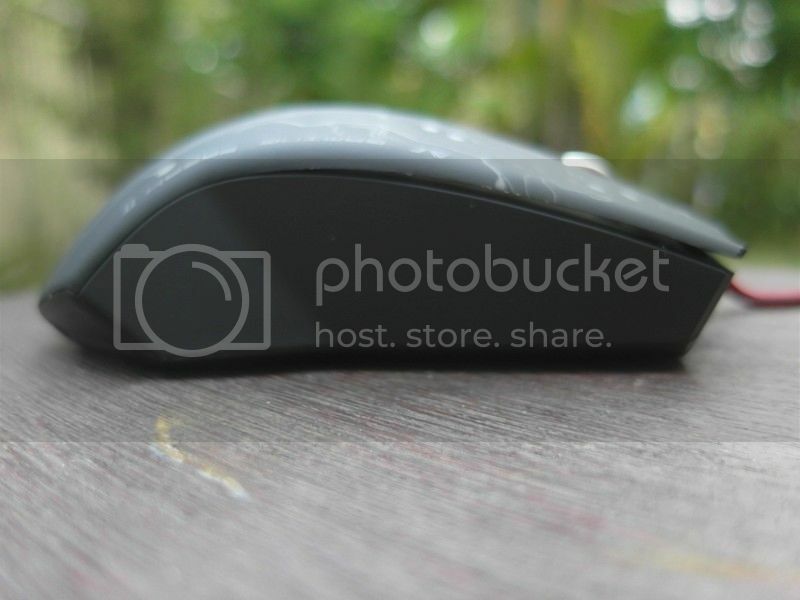 There are a lot of small dots on the left side of the mouse which helps to grip the mouse. The 2 buttons can be used with 3rd party software to custom configure its function. Same with the left side, the right side also have a lot of dots for easy grip and reduce slippery. The design of AVF AGM-X8 is suitable for claw grip user. The cable is tied with cable ties and fully braided with nylon for premium outlook. 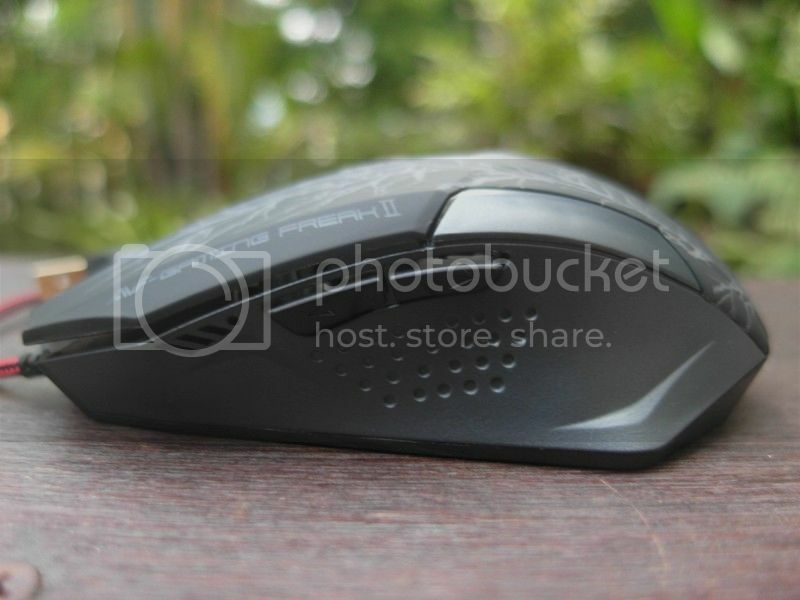 The back of the mouse is covered with shiny brown-like surface. 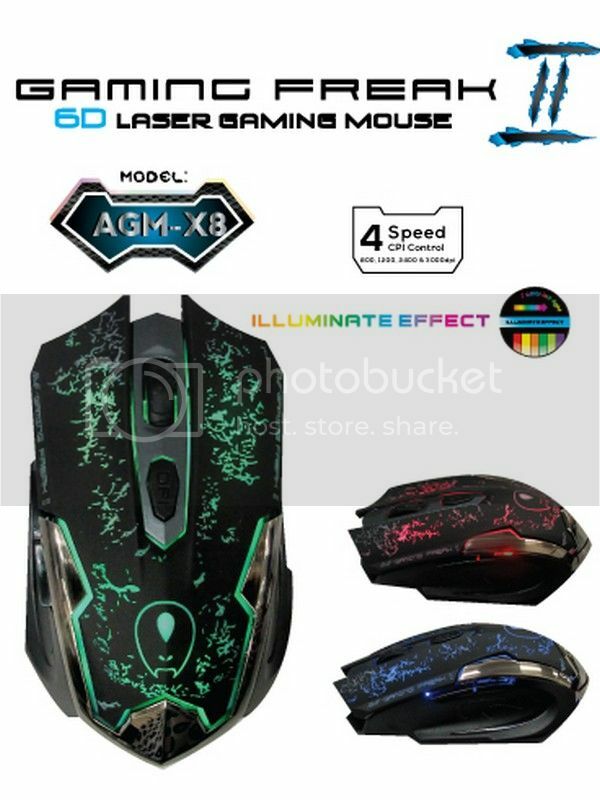 On the bottom of the mouse, user able to confirm the model name of AGM-X8 and simple information of rating and production year. 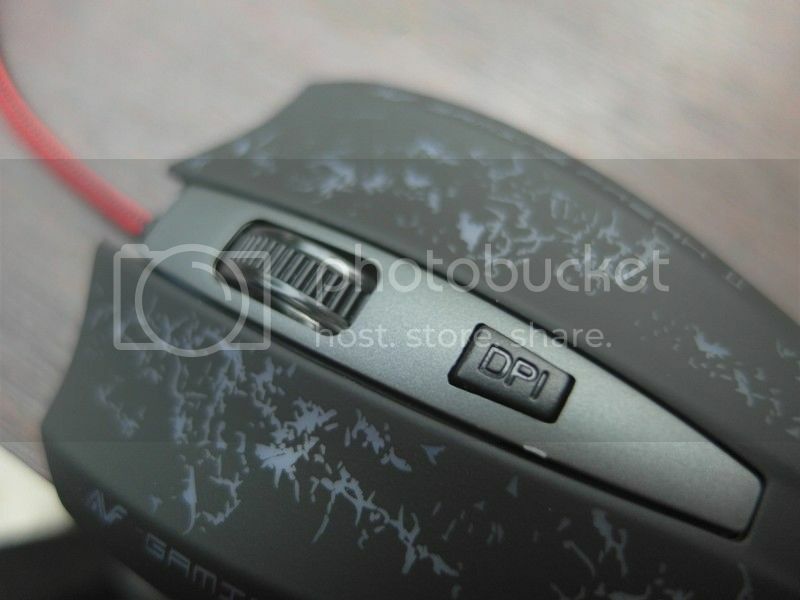 The mouse DPI Button switch is easily access just next to the scroll wheel which user able to select desire DPI range from 800, 1200, 2400 and 3000. 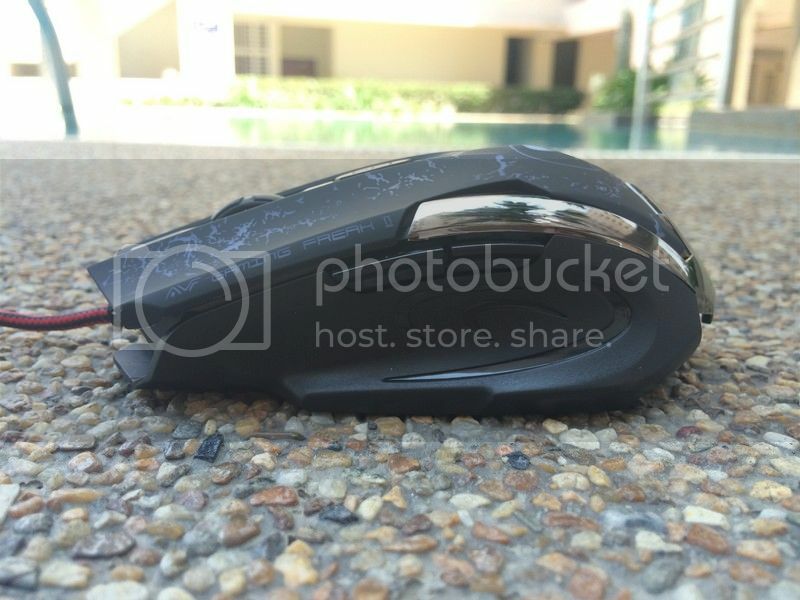 The left sides of this mouse have a unique shape compare with others model and 2 buttons that can easily costume configure by using 3rd party softwares. 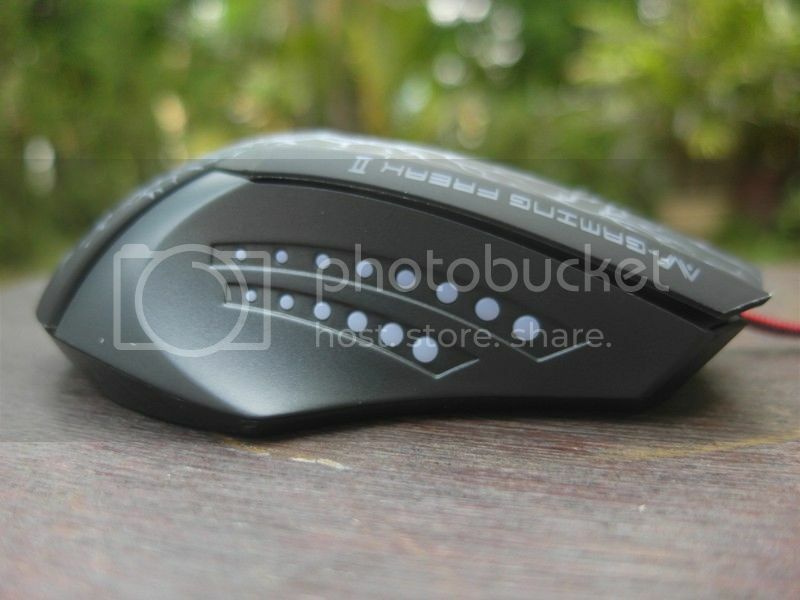 On the right side, the mouse have curve shapes but does not have illuminate led-light effects. 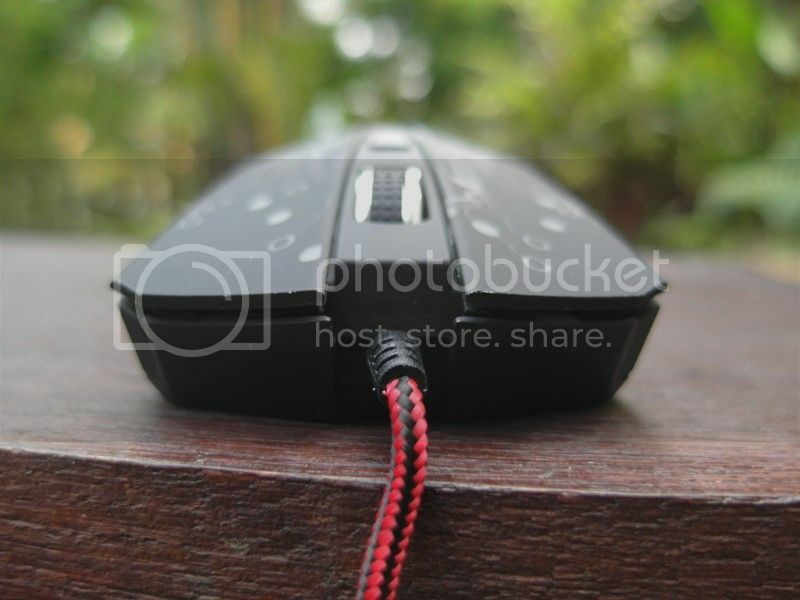 The front view of the mouse looks like sporty design with the braided nylon cable. 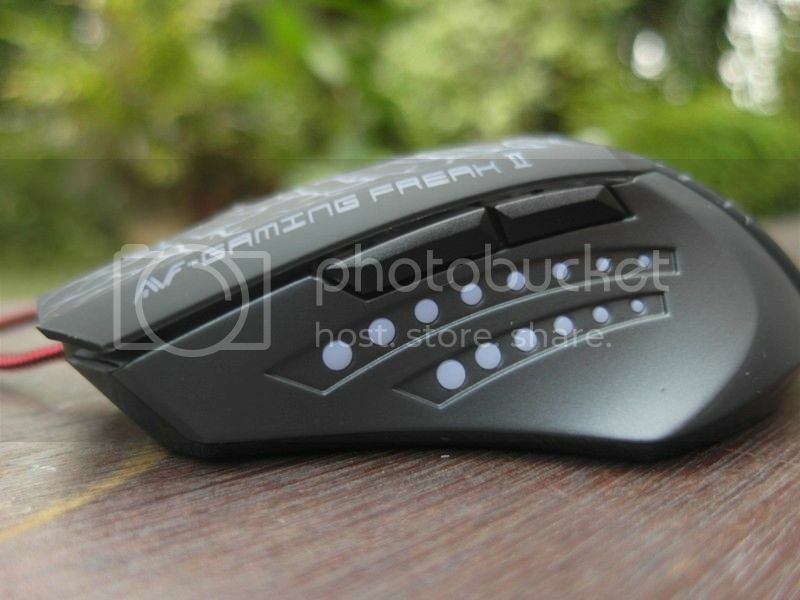 AVF Gaming Freak II Gaming mouse round up review has come to an end. There is 3 type of common grip style when using a gaming mouse, Palm Grip, Finger Grip and Claw Grip. 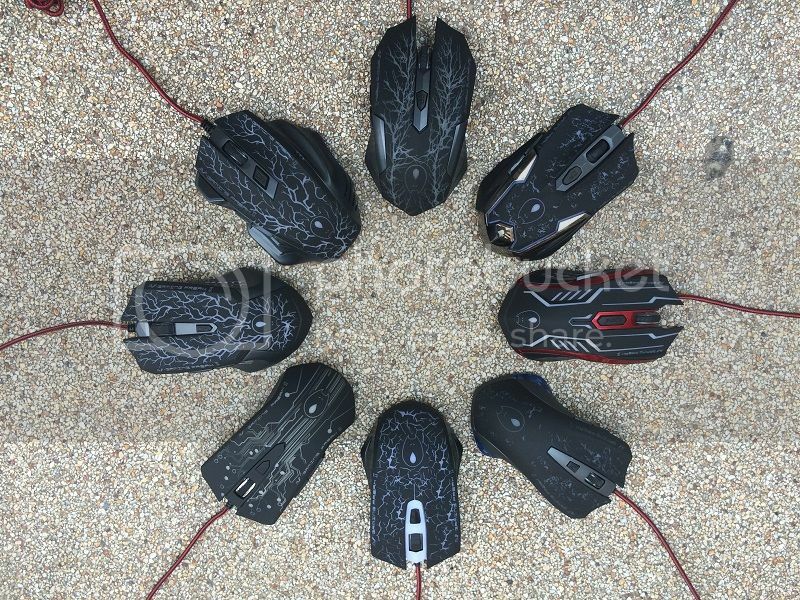 Each of the mouse models have different type of grips and design to help user find the right mouse to fit with their hands. The cord is braided with nylon. 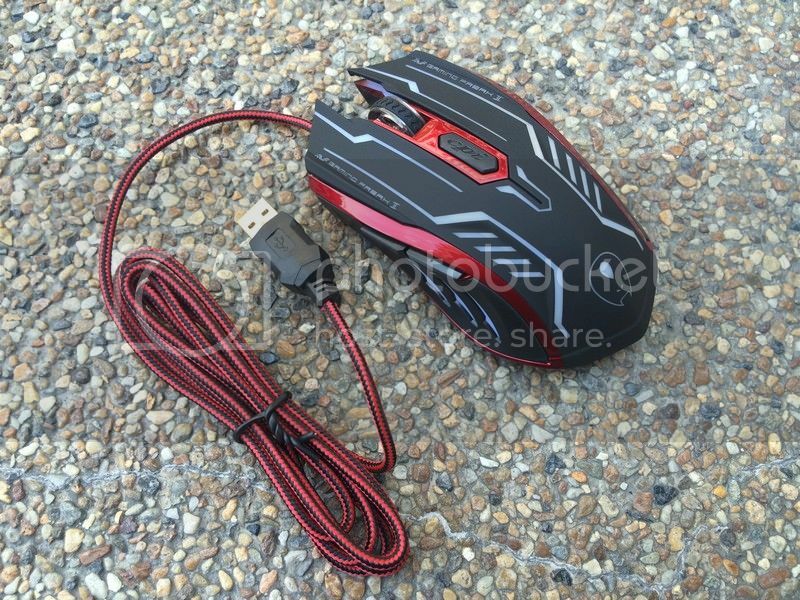 Braided cable is a must for gaming mouse but at the same time it must be very flexible and this mouse is built in with Ferrite bead to suppress high frequency noise in electronic circuits from the USB to the mouse. There are total of 6 buttons on each of the model that can be custom configure with 3rd party softwares, Eg X-Mouse Button Control as AVF does not provide the mouse with software as it just plug and play mouse. The DPI of the mouse can easily change with just a click on the middle top of the mouse which makes it easy for user, especially when playing 3rd shooting game from high DPI for swift move to low DPI for accuracy. 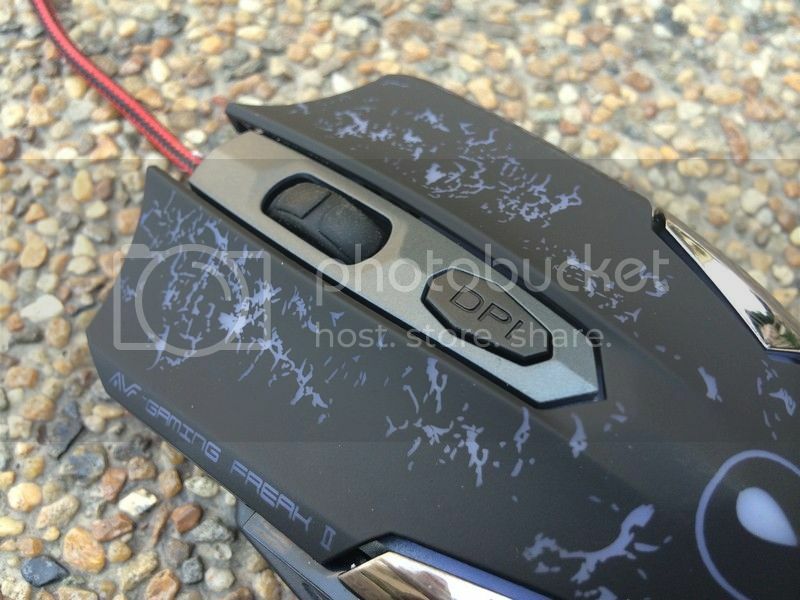 As the price tag is ranged from RM39 to RM49, this would the best mouse for a user that seek budget gaming mouse which support up to 3000DPI Laser driver. Great work AVF! + The price is dirt cheap! 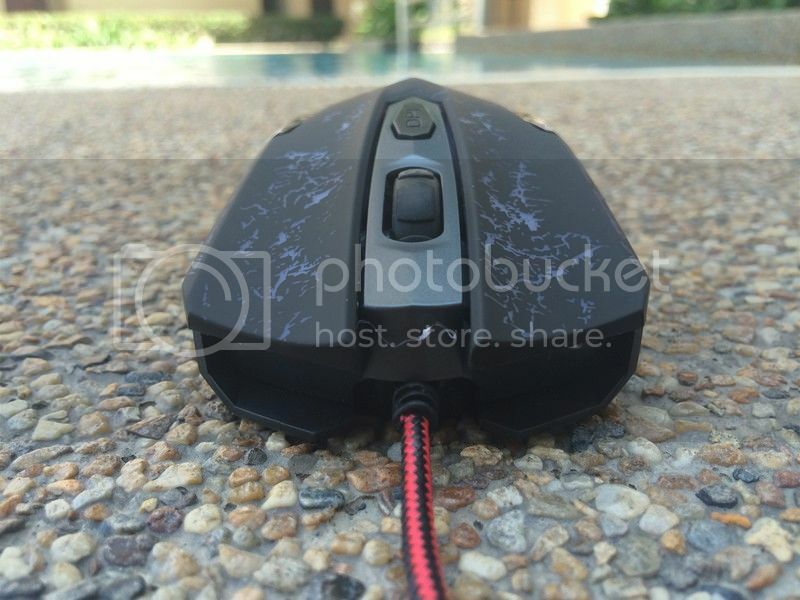 after 3-4 week (maybe month later) the right click is broke which i do using for Dota 2 and does not responding after click it need press harder to right click it..
"This mouse not suit for right clicker games like Dota 2,LOL,HON,starcraft 2 etc..."
is the durability of this mouse that bad? 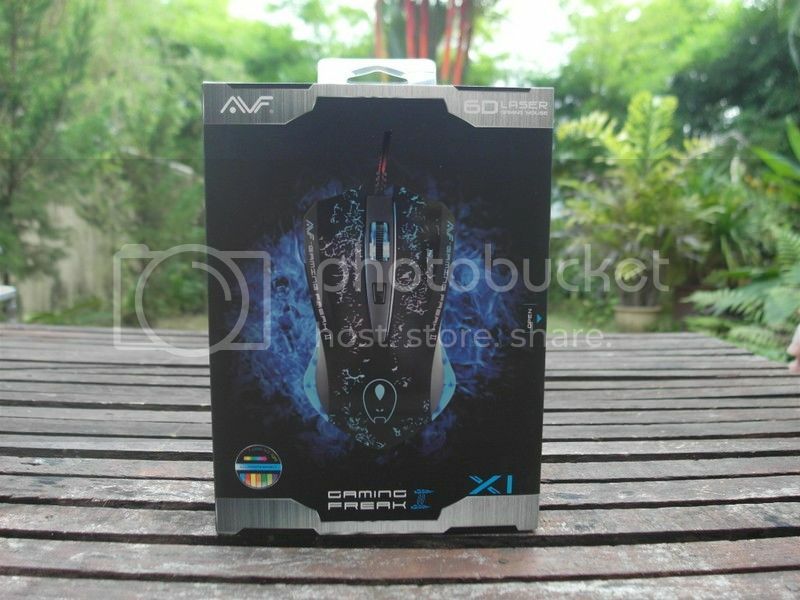 I brought the AVF Gaming Freak II AGM-X6 gaming mouse on 20/04/14 for RM69 at my local computer shop. I've been using the mouse ever since to replace my Apple Green 3D Series mouse, which I forgot the model which I brought for RM25 at the end of 2010. 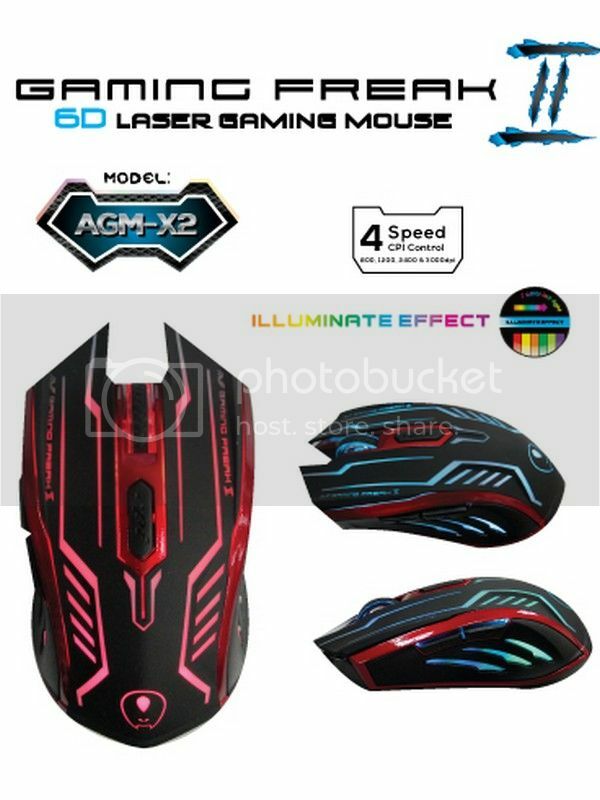 Here is my review based on my Apple Green 3D Series mouse as my base experience for a critical & fair review for my AVF Gaming Freak II AGM-X6 gaming mouse. 1. Comfortable for right handed palm users. 2. 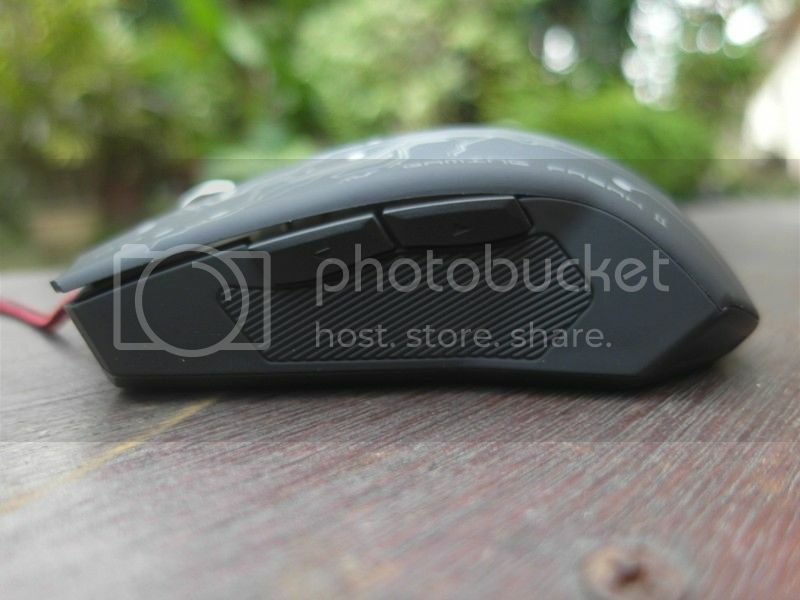 Works across all rough & smooth surfaces I've encountered, even though it's only an optical mouse. 3. Durable mouse except for it's mouse wheel. 1. Noisy left & right mouse button clicks. 2. Not durable mouse wheel. 3. Not so good mouse DPI button design; the button keeps stuck if pressed to hard. 4. 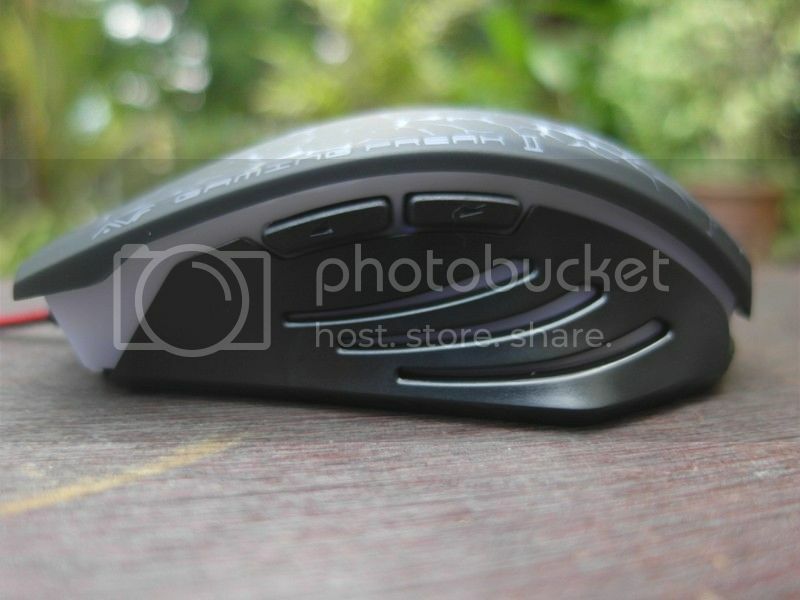 Not so good mouse button 4 & mouse button 5 design; the buttons keeps stuck if pressed to hard. 2. 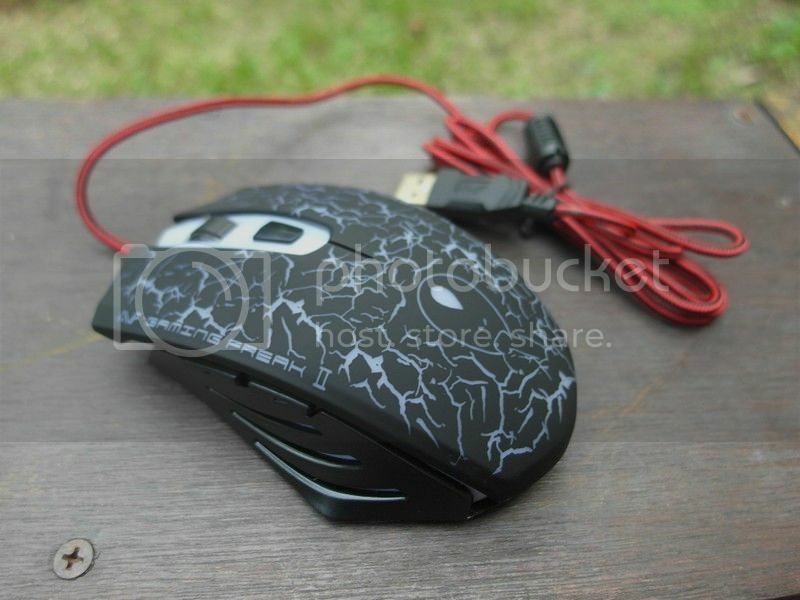 Nylon corded gaming mouse. 4. 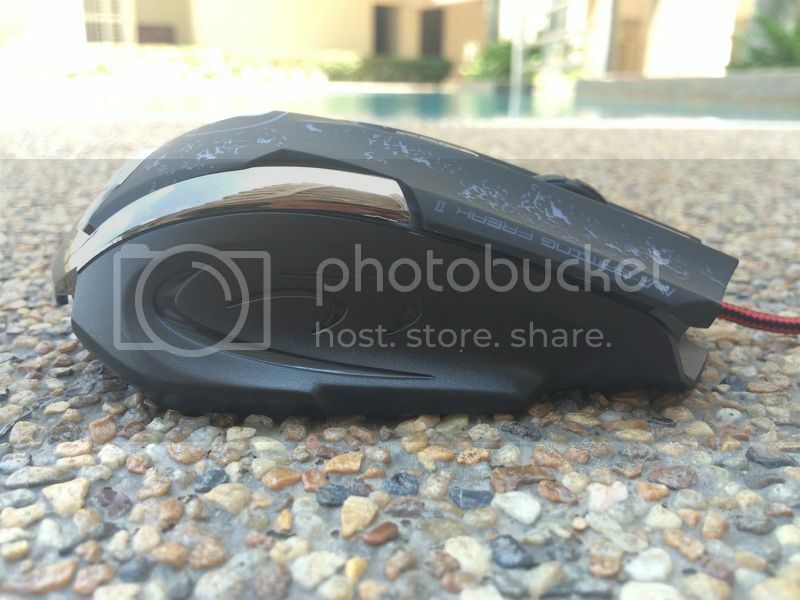 The most comfortable & ergonomic gaming mouse for large right handed palm gamers that I've encountered. 5. Silent left & right mouse button clicks (silent death button). 6. The left & right mouse buttons are adequately sensitive; Not a lot of force & displacement is required to push the buttons to register a click. 7. Works across all smooth surfaces I've encountered, even though there are a few rough surface where the mouse fails to operate perfectly. 1. Not durable gaming mouse cable. 2. The mouse wheel is a bit noisy while scrolling. 3. 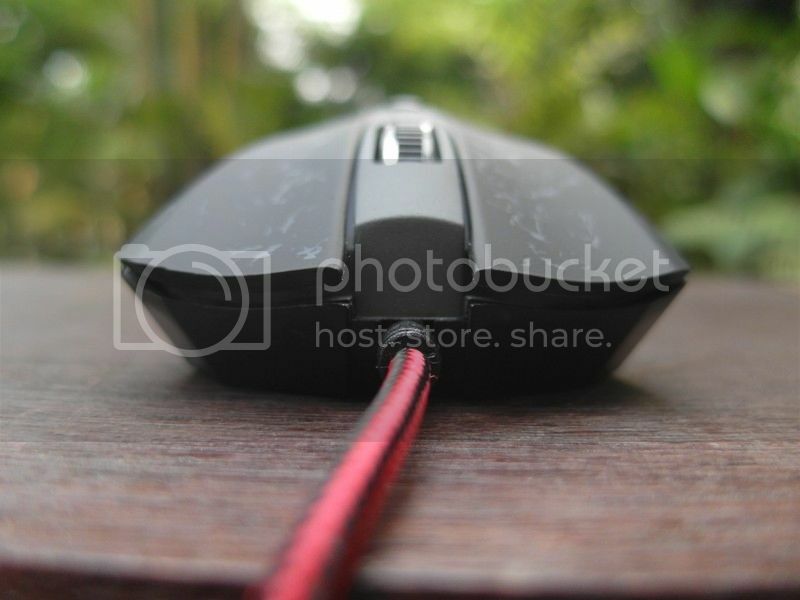 The mouse button is noisy while clicking. 4. Fails to operate perfectly across a few rough surfaces that I've encountered. 1. 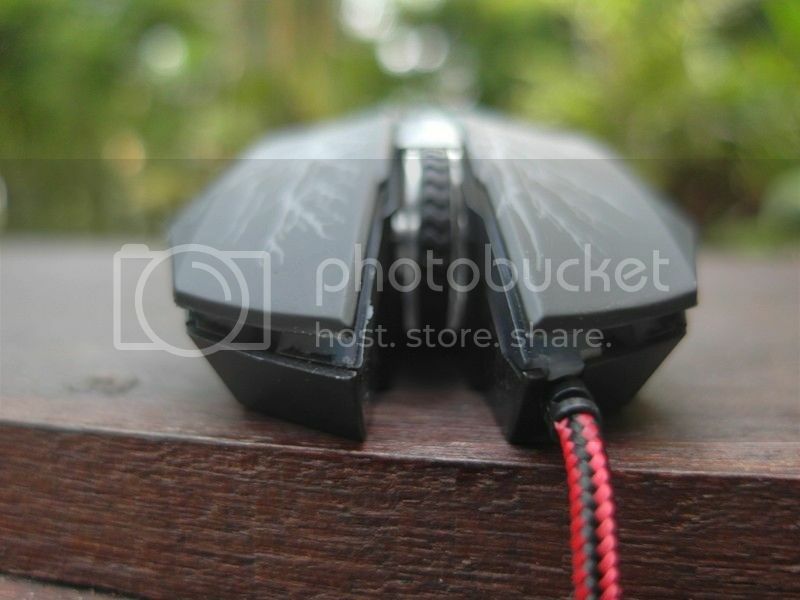 More durable gaming mouse cable. 4. Operates perfectly on all rough surfaces. 5. Controllable internal LED illumination lights; ON, OFF, colors & brightness. 6. Can adjust mouse weight. 7. Can adjust mouse length, width & hight. 8. 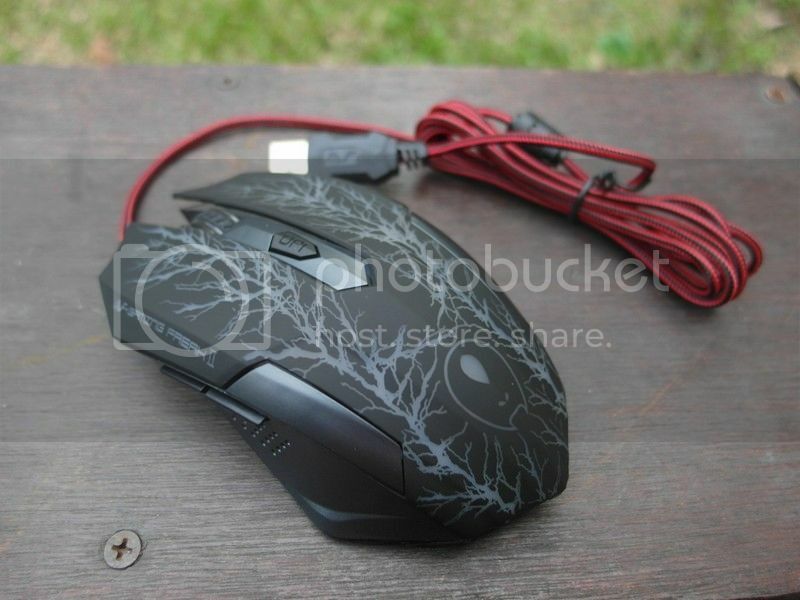 Comes with a choice for a wired and/or wireless gaming mouse mode; unplug the cable from the mouse to change form wired to wireless gaming mouse mode using Bluetooth/wireless. 9. 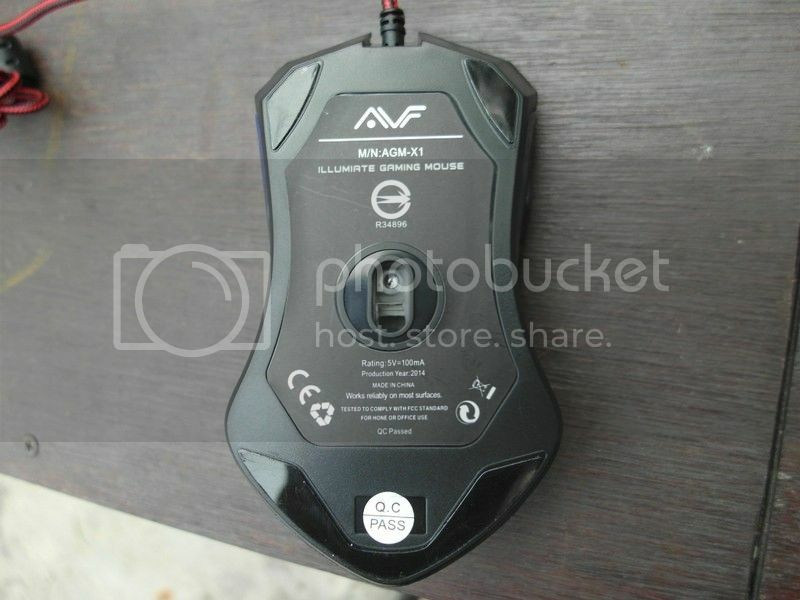 AVF provides its own software at its website to use/adjust/control with the gaming mouse. 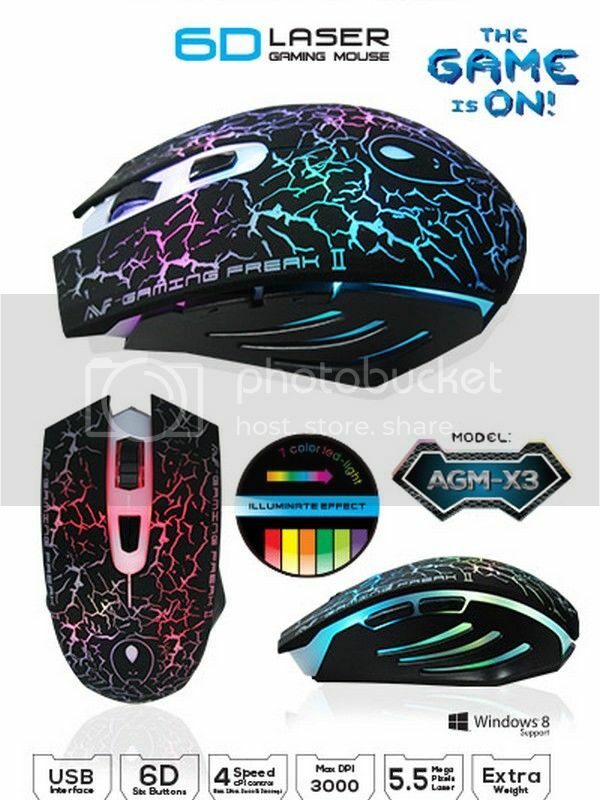 shah93 I guess I can't get a return merchandise authorization (RMA) for my AVF Gaming Freak II AGM-X6 gaming mouse as I'm now over the 3 month warranty period? The mouse was overwhelming as it has been sold 26k in 3batches on particular AGM X6. i bought AGM-X3 on 29-mar-2014. i was so impressed with the silent buttons. about 3 weeks ago i had problem with the left button. to click something i have to press hard the button. 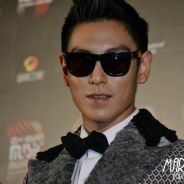 what happen to 5 millions time a life?